It’s been a while since I’ve posted here but I’m back with some photos of our weekend getaway in the Berkshires! We’re definitely counting down the days until the 2019 Tanglewood season starts up and we can be back in the Berkshires full-time for another summer of classical music on the lawn, picnics, hiking and all of the things we love so dearly about Western Massachusetts. 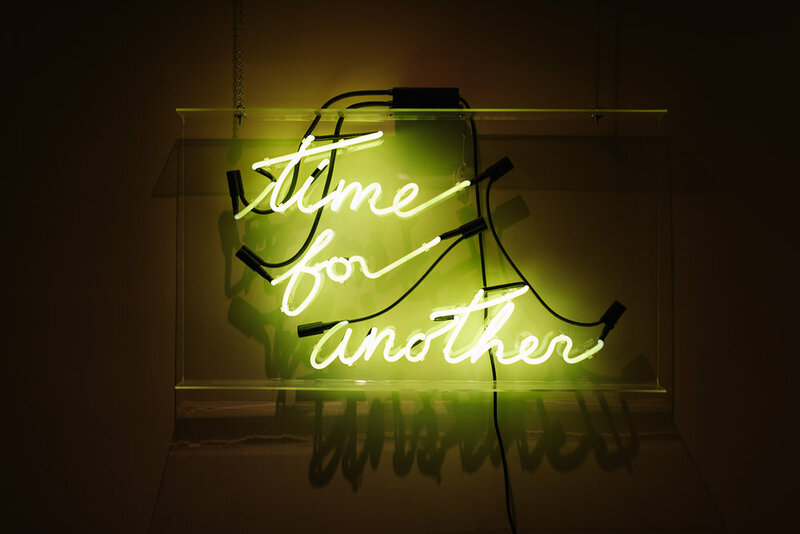 Until then, we’re always looking to escape our fast-paced city lives and slow down in the Berkshire hills any chance we can get. 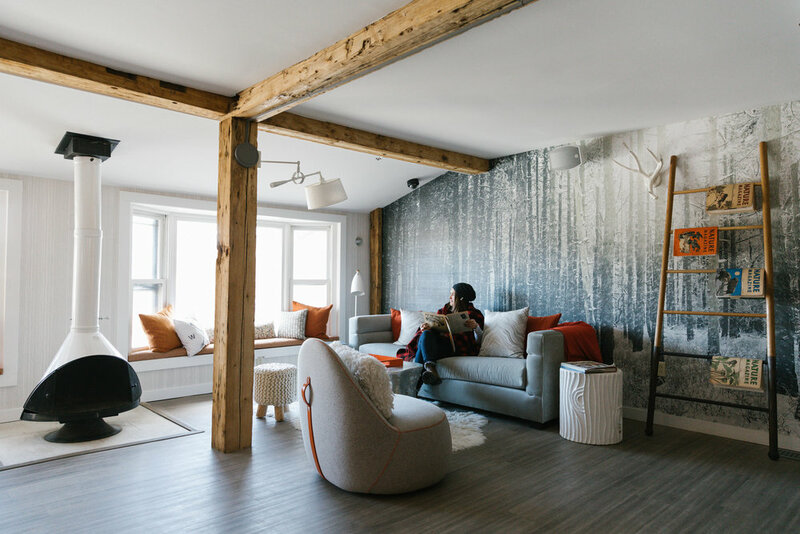 We spent two nights at Tourists Welcome, a very cozy and hip, dog-friendly hotel in North Adams. This was our second time staying here and since our first visit last fall was so comfortable and enjoyable, we knew we would be back. Elsie gets the royal treatment from the staff with treats every time she’s greeted in the lodge so she’s also a huge fan. 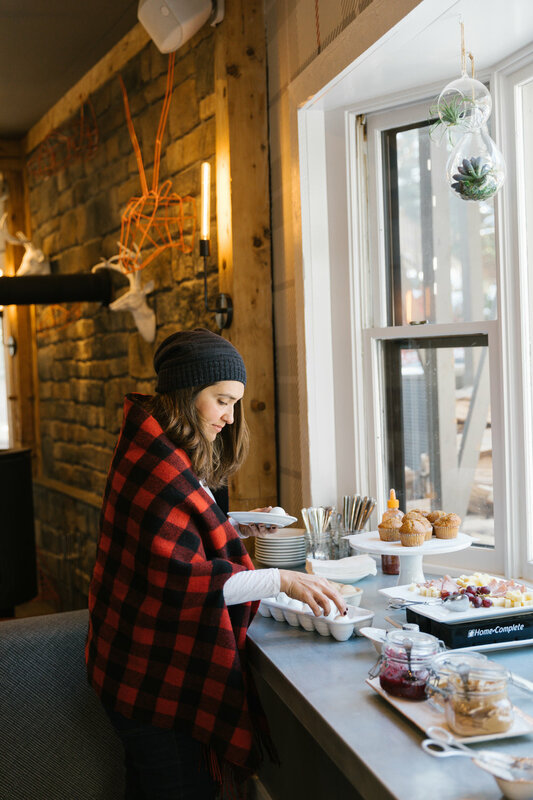 We love waking up and going straight to the lodge for some espresso drinks and breakfast. Tourists has great food options so we like to linger in the lodge with our coffees and bites before going on a hike with Elsie. I was especially excited to check out the Appalachian Trail that’s not too far from the hotel and wander in the woods for a while after not being able to walk or hike all of last summer with my broken foot. I laughed when we saw a sign on the trail that said, 4 miles to Vermont. I always forget how close Vermont is from this part of Massachusetts. 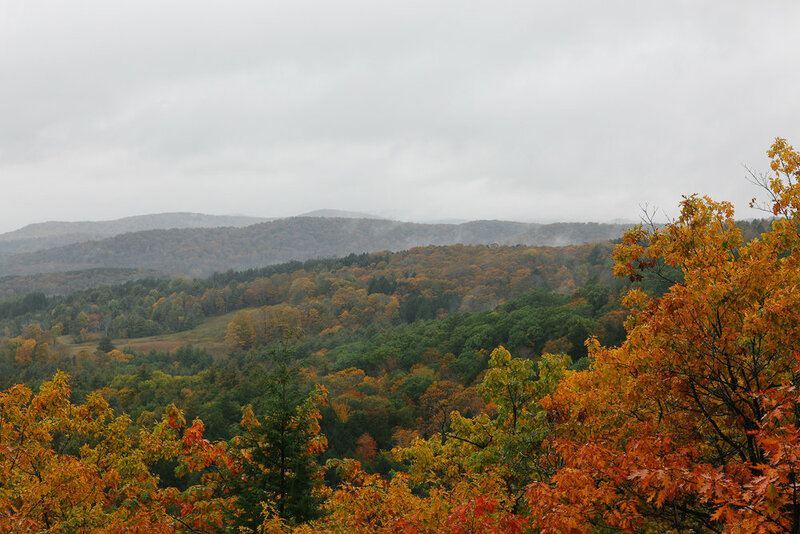 We often forget how big the Berkshires are and North Adams has a lot to offer. 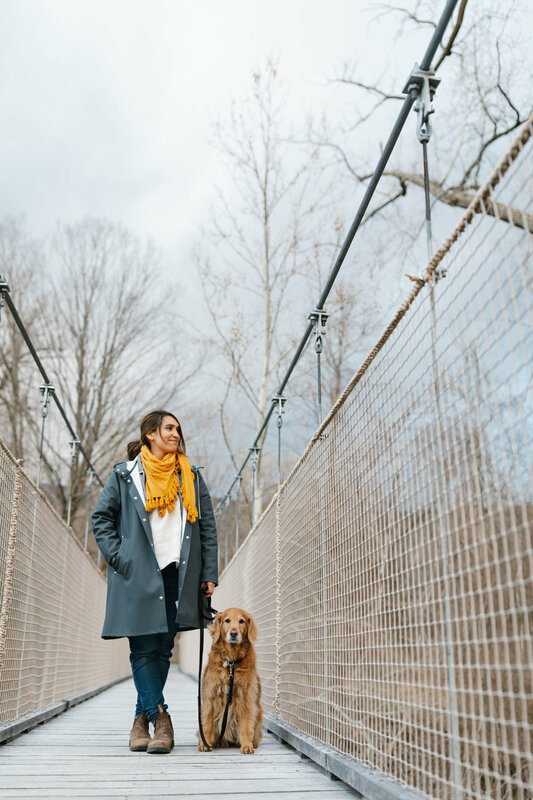 Some of our favorite things to do in the N. Adams area are spend a day wandering around Mass Moca and/or The Clark but on this particular trip we didn’t really feel like leaving the hotel much. It’s such a cozy space with plenty to entertain us, plus it was still a little cold out. We even woke up to snow in April! We watched movies in bed, raided the mini-bar, and got take out from A OK Barbecue. This was a rare 3 day weekend for Adam so we really needed to relax and Tourists was a great place to do just that. We were craving time outdoors in nature after a long winter in Boston. We even had our Monday night date night at the newly opened Airport Rooms next to the hotel. Hello, wedge salads, frites and wine! What else could we ask for? We woke up to a spring dusting of snow. On our second day we visited Cricket Creek Farm in nearby Williamstown. They have a great little farm store with raw milk, local meat and it’s where they produce all of their delicious cheese! I’ve been buying their cheese for years so it was really nice to see where it all comes from. There are lots of farm animals and the view and landscape is so pretty. You can walk around and learn about the history of the farm all while stocking up on local foods. After that it was back to the hotel to read books, drink tea and take a relaxing walk across the suspension bridge and through the woods. Life always feels like it’s happening at a slower pace in Western Mass and I can’t wait for us to return. 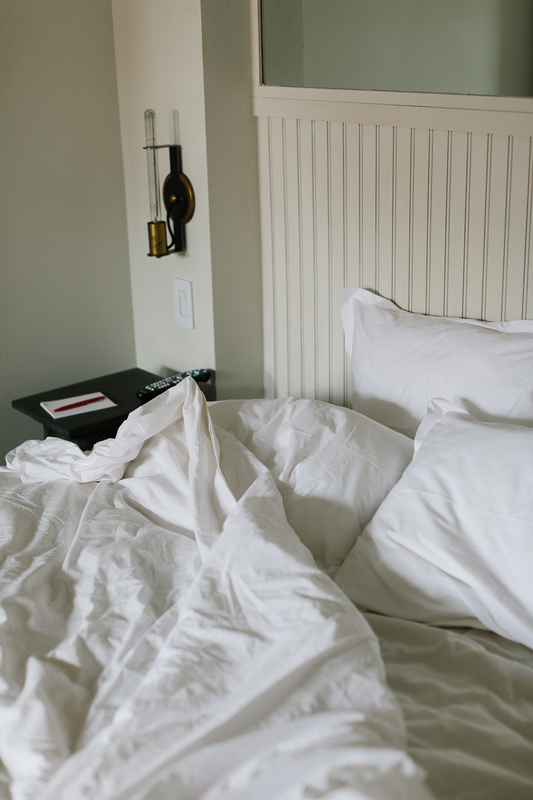 The coziest Casper mattress and all the linen bedding. Thank you for the wonderful stay, Tourists! We know we’ll be back soon. After our road trip to Portland we continued making our way up the coast of Maine. Our next stop was the Lincolnville Motel, which I’d heard about from a friend who’d stayed there the week before. Once I saw the cute little cabins on their website and learned about the 3 month old golden retriever puppy that the innkeeper had, I knew this was a good spot for us to land. The drive from Portland was short and enjoyable and we took in all of the fall colors along the way. The Lincolnville Motel is a charming mid-coast motel but also has the cutest little cabins that are pet-friendly to boot. We stayed in a cabin for our first two nights then moved into a room in the motel for our last night which was much more spacious. 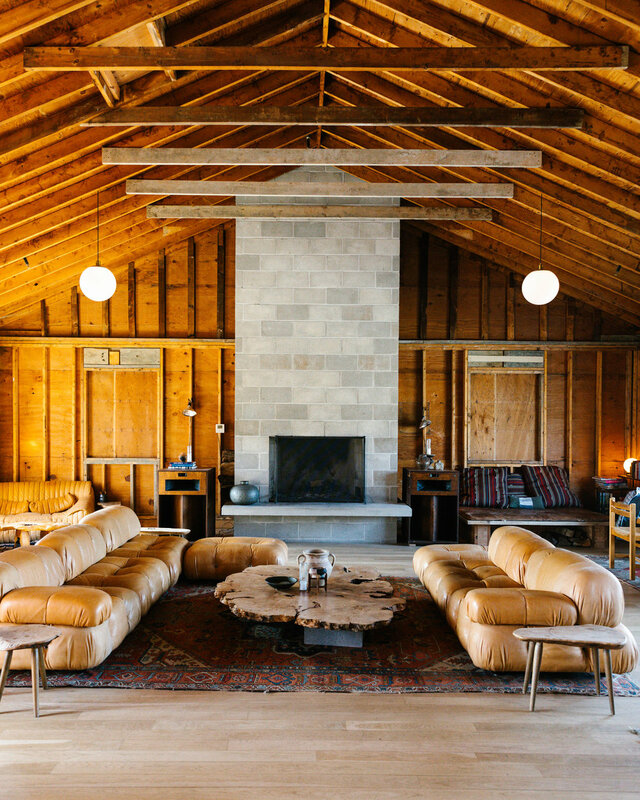 The cabins are rustic, cozy and so fun. Each room has a record player and we enjoyed listening to old-timey records from the motel’s collection. 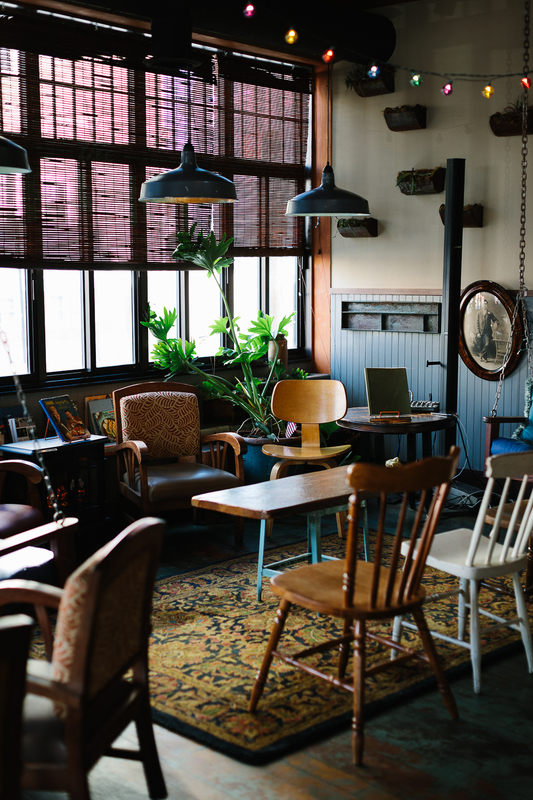 The motel’s common areas were also really relaxing with an impressive cookbook collection to peruse and plenty of board games, records and a fire burning to warm you up. This was a great spot for us to slow down and enjoy the area. We went for walks by the water, hiked in Camden Hills State Park, visited the oldest organic apple orchard in Maine and had some tasty meals at Longrain in nearby Camden. So much to enjoy along this stretch of the coast! On our second night we trekked out to Tinder Hearth for some wood-fired pizza. This was a bit of a drive but it’s been on my list so we had to make it happen! It was SO worth it. 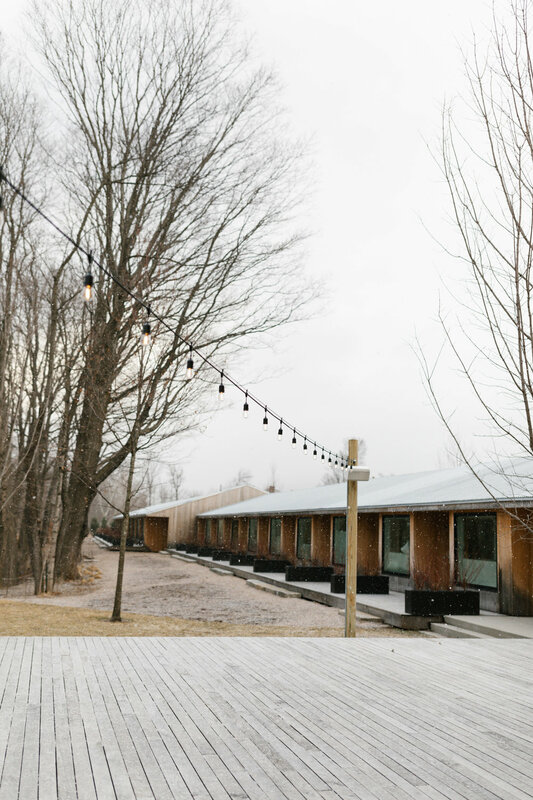 We meandered down back roads along our way and loved the delicious pizza, the magical landscape and the overall experience at Tinder Hearth. 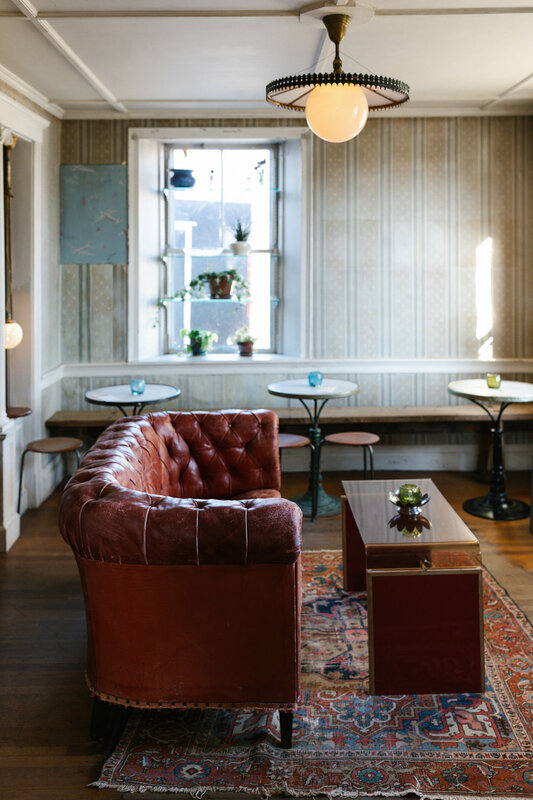 We highly recommend making your way up to Tinder Hearth! I also stopped by the Swans Island Company dye house and flagship store. After spending so much time in a yarn shop this past summer learning to knit (to pass the time while my foot was broken and recovering from surgery) and hearing experienced knitters ooh and ahh over their hand dyed yarn, I was eager to see where the dye magic happens. I got to chat with Tony their dyer and see all of the behind the scenes action. What a treat to take his portrait! He single handedly hand dyes all of the Swans Island Yarn. I loved geeking out for a bit about natural dyeing with him. Tony Vinci, Natural Dyer at Swans Island Company. We had high hopes of making our way farther north on this trip but we found so many things to do in the Lincolnville area that we decided to take our time and save Acadia and Deer Isle for a later trip. On our drive back we stopped at the Owl’s Head lighthouse before stopping for the most delicious oysters at Glidden Point Oyster Farms. Thanks for the recommendation, Mat! This road trip was so fun and exactly what we needed for Adam’s last week of vacation before starting up another season with the BSO. Coastal Maine, you have our hearts and we can’t wait to return! Have you visited this part of Maine? Any favorite spots we misses? Comment below! Last week we loaded up the car for a road trip up the coast of Maine. With Adam on vacation and my foot finally starting to get better (more on that later), it seemed like the perfect time to make our way north for one last hoorah before we hunker down for another symphony season. We had so much fun on our last trip to Portland that we knew this would be a great place to start. We had a loose itinerary in mind with the goal to reach Deer Isle or Acadia National Park before making our way back to Boston at the end of the week. Here’s how it went down, where we stayed, where we ate and what we did! With elsie in tow we knew that we needed dog-friendly lodging so we decided to stay at the Francis Hotel while in Portland. If we’re honest, we also chose the Francis because it’s directly across the street from Tandem Coffee and Bakery! (sorry, elsie) Sadly, upon our arrival, we learned that Tandem was closed for both days that we were there for their annual corporate retreat. Such a bummer! Anyhow, we stayed in room 1 which is a very spacious suite on the ground level of the hotel. Our suite felt more like an apartment than a hotel room which we appreciated a lot. 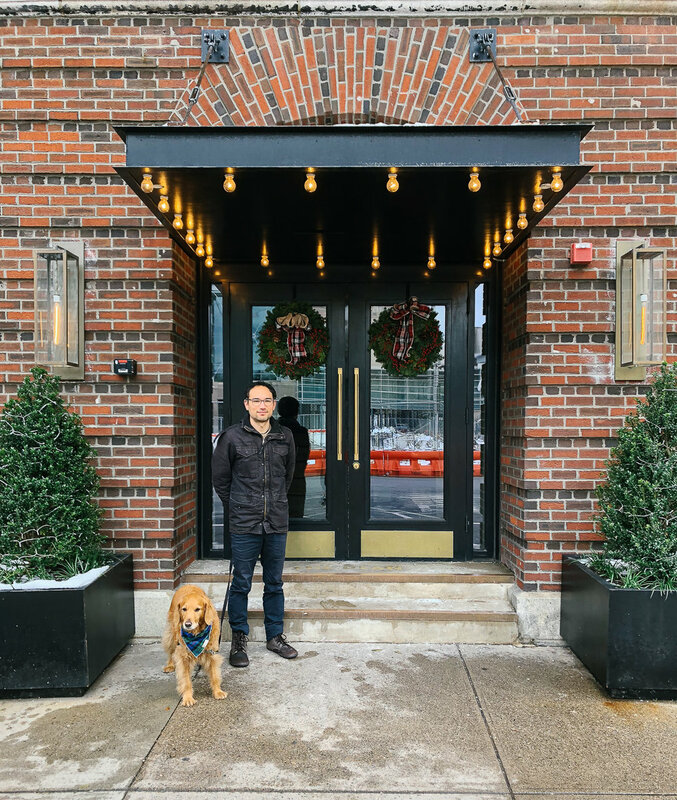 The Francis Hotel is in a very good location, near plenty of restaurants, coffee shops, and we liked walking elsie around the neighborhood. Currently there’s some construction going on behind the hotel so be aware of this if you’re sensitive to noise. When we woke up our first morning there we found this sign and bowl of treats outside our door! 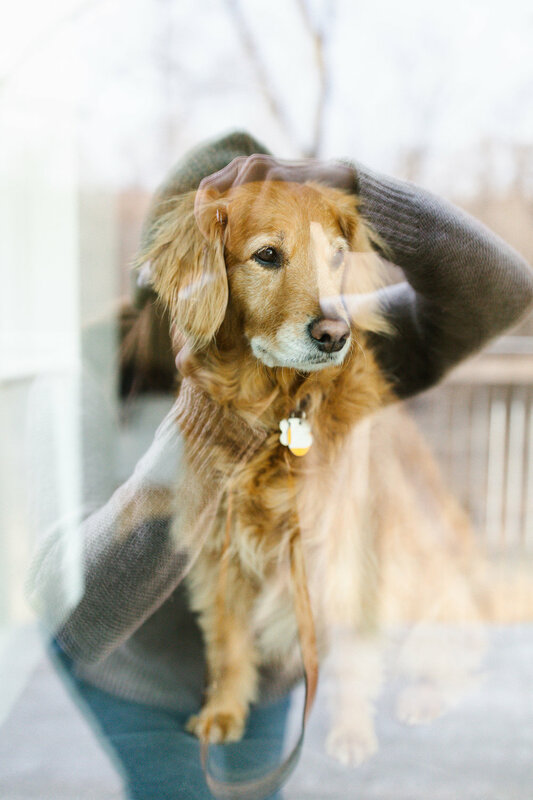 There’s nothing better than a hotel that makes us feel truly welcome with our pet. Elsie really loved the treats and I think she really liked the extra attention. This will be our go-to hotel when staying in Portland. Being able to travel with our dog saves us stress, money and shows us a different side to a city that we may not experience without her. We had a wonderful stay here. 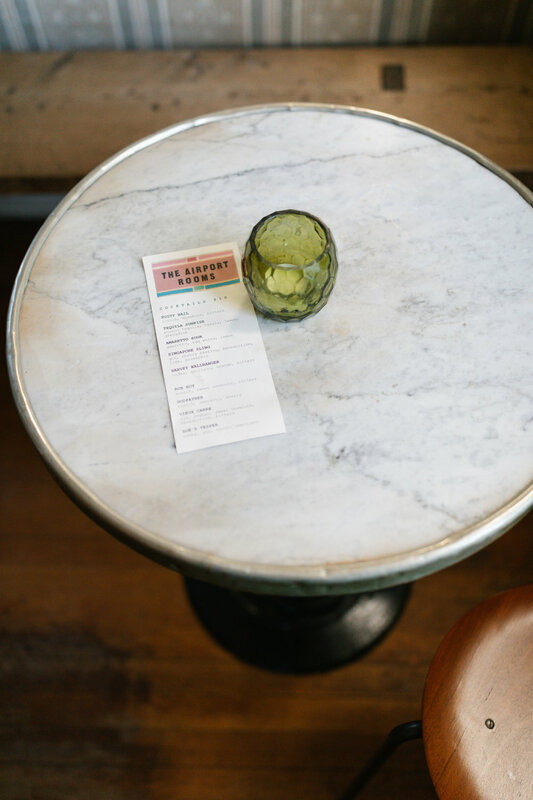 No trip to Portland is complete without trying out some new restaurants and we have quite the list to get through. Izakaya Minato - For dinner. We absolutely loved our meal here. We did the omakase tasting and threw in an order of tuna poke because why not.. Highly recommend! Mr. Tuna - It was a little difficult to find Mr. Tuna but once we did, we were glad we did. I would go back here in a heartbeat. Pop onto their facebook or instagram page for the mr. tuna food truck locations. This was more like a snack for me so you can squeeze this in before or after a meal if you wanted to, in my opinion. LB Kitchen - I ate here twice during this trip. If I’m honest, I don’t always have the stomach to eat out for several meals in a row and sometimes I don’t want to feel like a glutton. So, when I get that craving for veg and nothing but veg, I go here. 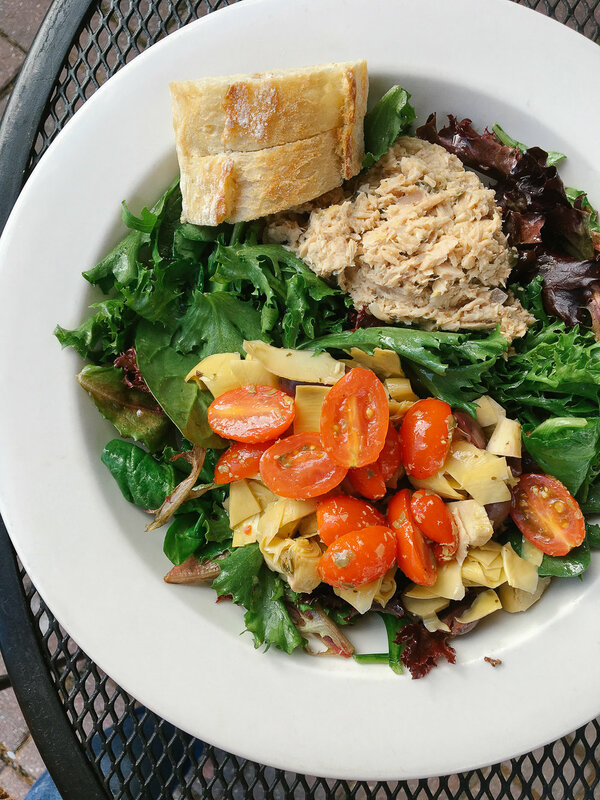 It’s a dependable spot for healthy, good feeling food. Little Giant - We had dinner with our friends here and it was a pleasant atmosphere and enjoyable night. High Roller Lobster Co. - The wait was long, the lobster roll was ok. Ten ten pié - We learned about this place from a pal at Allagash Brewery who used to bake professionally in Portland. When I asked him who had the best pastries in Portland, he mentioned this place. Once Adam saw that they had onigiri on their menu, we couldn’t leave town without stopping here. Adam also got a cookie that was so good it never made its way to me. grr..
All those who wander - Brand spanking new espresso shop in the Black boxes on Washington Ave. They serve Parlor Coffee (Roasted in Brooklyn, NY) Super cute, super good! The owner/barista used to work at The Shop in Providence, RI. Little Woodfords - For coffee. With Tandem tragically closed during our visit this became our go-to coffee spot. Super cute. Campfire Studio - lovely Maine made ceramics in the black boxes at 93 Washington Ave.
Judith - don’t say I didn’t warn you.. You’ll want to buy all the clothes here. Portland Dry Goods - always love going in here. Lastly, we couldn’t miss a tour and tasting at Allagash Brewing Company! Adam is such a beer lover and he was very excited to check out the behind-the-scenes action at the brewery and do a tasting. 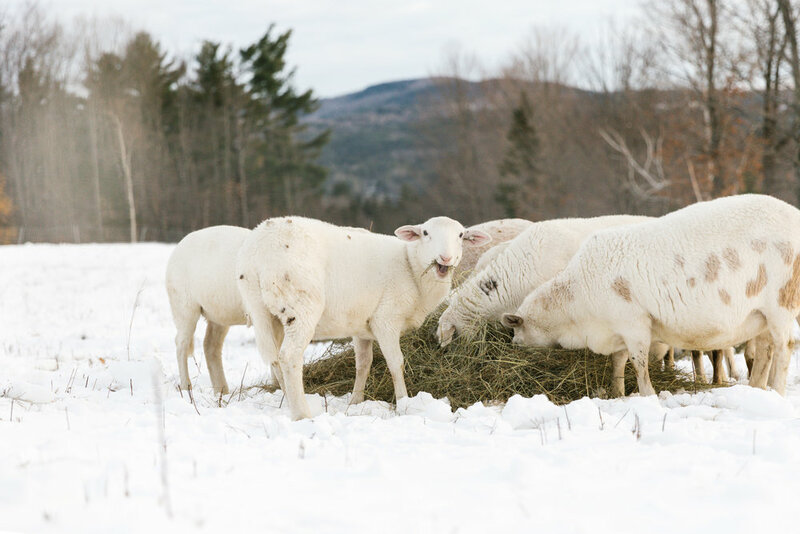 I was really impressed with all of the local farms they work with for their ingredients and their commitment to using as many Maine grown grains etc as possible. A must-do for beer lovers. How happy does Adam look to be touring the Allagash Brewery?! After Portland we drove up the coast to Lincolnville, Maine. Stay tuned for that post! Did we miss any must-sees or must-eats in Portland? Comment below with your tips! As always, thanks for reading. Providence, Rhode Island is quickly becoming one of my favorite cities to visit in New England. 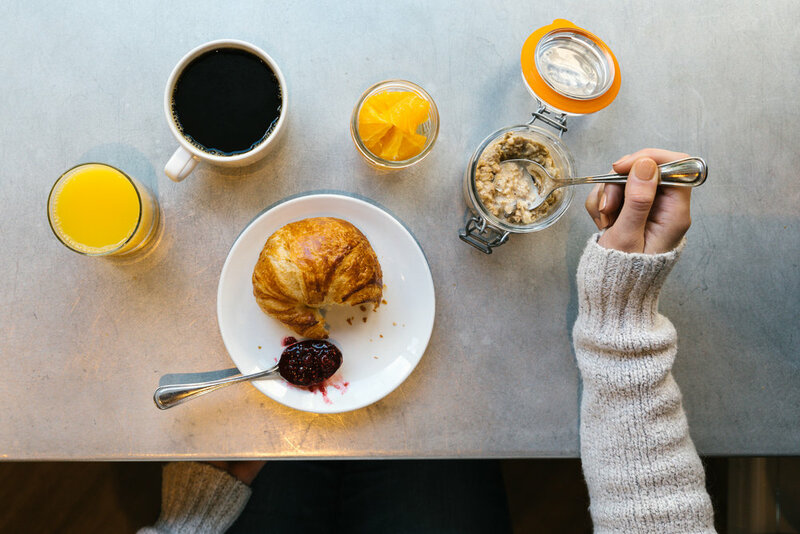 It's a quick drive or Amtrak ride from Boston and I've enjoyed getting to know it's food and coffee scene over the last year. My friend Christine is a writer and photographer for Edible Rhody and she's on the pulse of all things local and food related. She's introduced me to many of her favorite people and places in this little city and let me tell you, Providence has been winning me over big time. 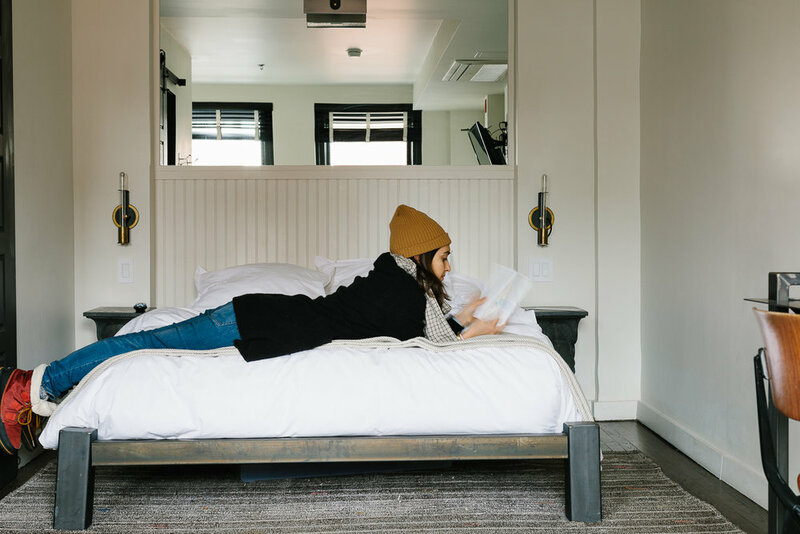 I decided it was time to spend a weekend exploring more of this town with Adam and Elsie and we knew there was only one place that we wanted to stay, the Dean Hotel. 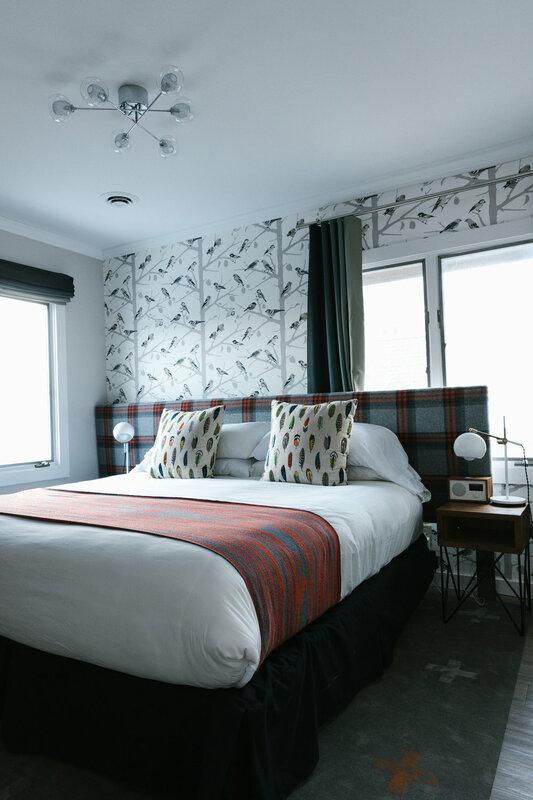 The Dean is a small, boutique style hotel which feels hip, cozy and historic all at the same time. 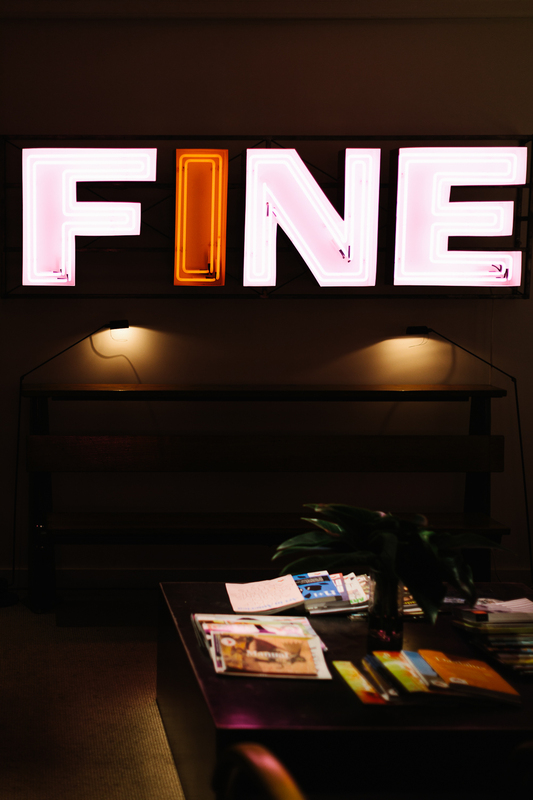 In fact, it reminded us a lot of our stay at the Highline Hotel in New York City last year. We love a beautifully designed hotel, but throw an excellent espresso bar in the lobby and we're over the moon. 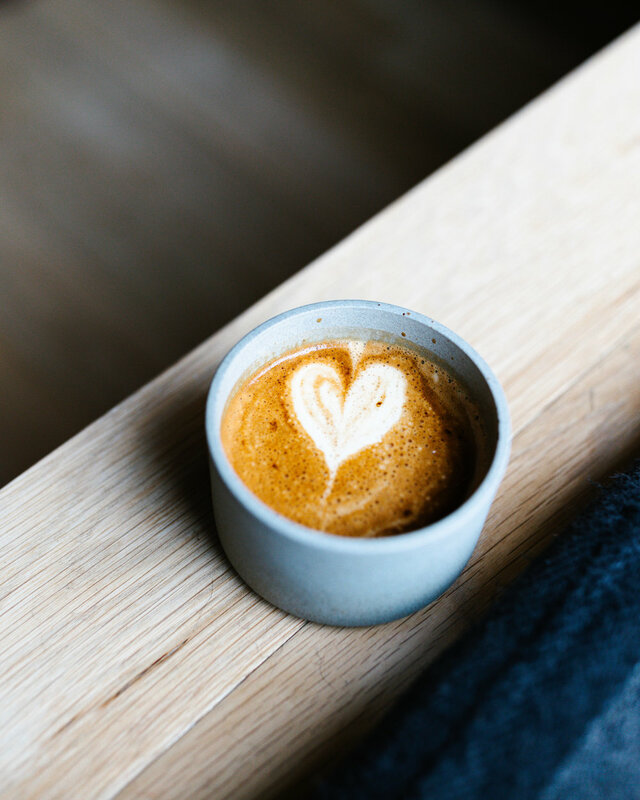 As I mentioned in my last post, we're big fans of coffee and with Bolt Coffee Co in the lobby of the hotel, all we had to do was head downstairs for our morning cortado and americano. Plus, having Elsie join us was so fun and convenient. The Dean is located in the heart of the city, is walking distance from several great restaurants and it's dog-friendly! From the moment we arrived the staff was attentive and helpful throughout our stay. Upon our arrival, Elsie was given a small bag of quality dog treats to help her with any anxiety she might have about her new surroundings. This was such a nice touch and one that we appreciate immensely when traveling with Elsie in tow. The nor'easter: eggnog, espresso and milk. So tasty! Dogs at coffee shops makes me so happy! Elsie eating all of the donut crumbs off of the floor 🤣. Excellent dog treats compliments of the front desk. Elsie LOVED these treats! 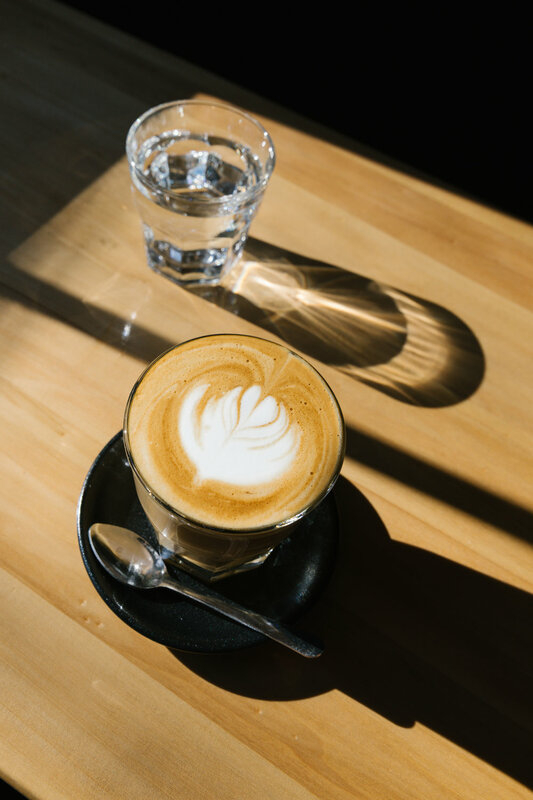 a cortado at bolt coffee co. Pro tip: The elevator might freak your dog out so we recommend taking the stairs to and from your room. Providence has an impressive food scene and we were eager to dine at some of the restaurants that our friends have been raving about. 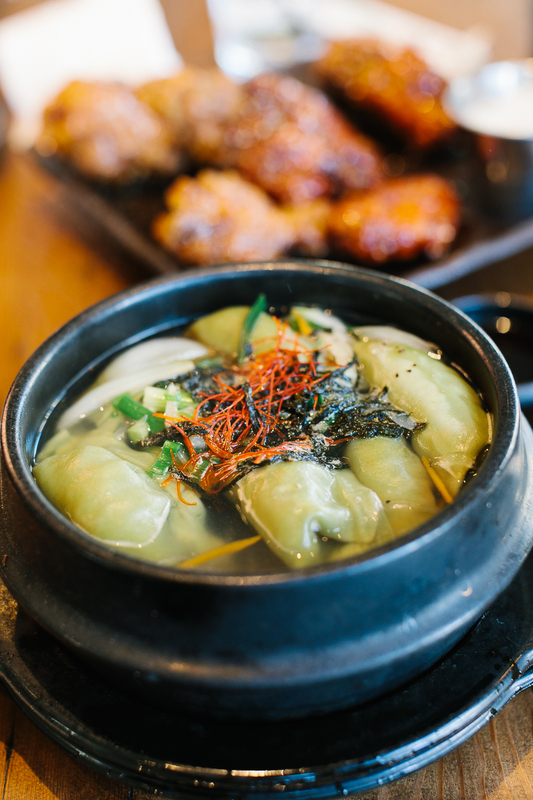 One of the first spots on our list was Den Den for Korean chicken wings! Adam loves Korean food and I loooove chicken wings so this was a no brainer. This was not a light meal but it was delicious. Someone at the hotel said we must get the kimchi pancakes so we did. Soooo good! I love kimchi everything. In an attempt to order something "healthier" we also got the vegetable dumpling soup. This could be your only meal for the day if you wanted it to be. Even though we were pretty full from our lunch at Den Den I really wanted to have a meal at North, so we rallied. North is attached to the Dean Hotel which made for the easiest walk from our room. They don't take reservations but we were able to snag a table at around 8 pm. The hipster vibe was strong, the cocktails were interesting and Adam was super happy eating all of the noodles. My favorite dish was the charred broccoli, but we also enjoyed some oysters, mini ham biscuits and a celery root dish. The next day we met up with my friend Christine for brunch at the Grange on the West side of Providence. We were craving something lighter and more vegetable forward so the three of us all ordered the smoked mushroom frittata and we split an order of the cauliflower. It hit the spot after a day of heavier food. They also have a juice and smoothie bar if you're craving that. Thanks for introducing us to the Grange, Christine! Cozy vibes at the Grange. For our last and favorite dinner in town we went to Oberlin. Everyone that I mentioned Oberlin to was really enthusiastic about their experiences and insisted that we go. We got a seat at the crudo bar, again no reservations, and enjoyed a really fantastic meal. Everything about this place made us happy and we can't wait to return. The gnocchi was to die for but honestly we thoroughly enjoyed each and every dish that we had. We ordered: the surprise combo (raw), marinated olives and bread, grilled scallions, crispy sunchokes, the gnocchi and slow roasted carrots. Hands down our favorite meal of the weekend! Turns out that Bon Appetit agrees with us. 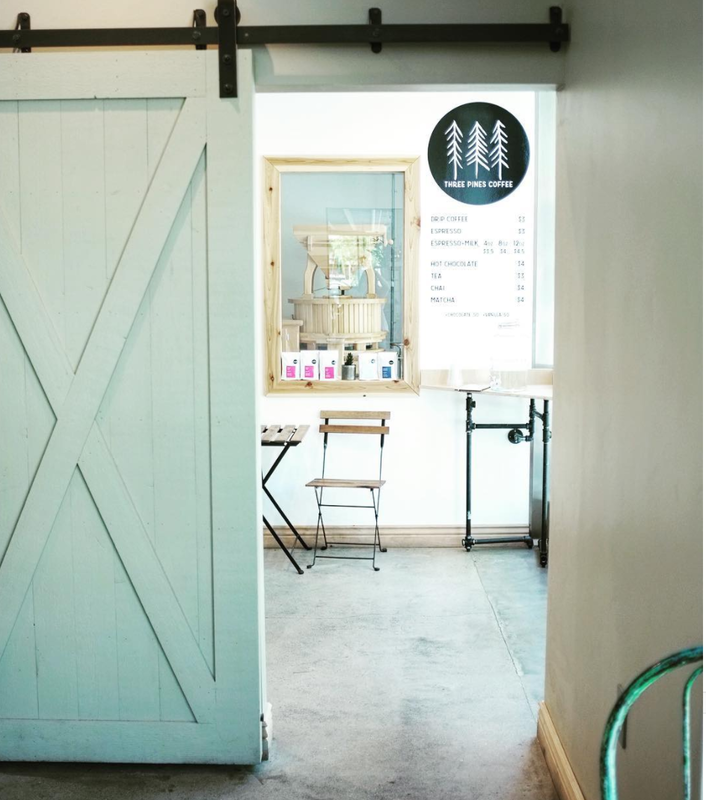 The Shop is another favorite for coffee, avocado toast and snacks. You many have seen it when Alton Brown was recently in town and in search of Providence's best coffee. I should have taken this before we devoured the salad. Oops! Exploring Providence on our way to the RISD Museum. The Grange when you just need some veggies. Nick's on Broadway recommended to us but we didn't make it this trip. RISD Museum - We love visiting museums when we travel. This is a nice little museum that won't overwhelm you the way that say the MET does. Also, admission is free on Sundays! Providence Athanaeum - Insta famous spot. If you're looking for a quiet spot to read or get some work done, this little library is magical. So many nooks and corners to be inspired in. The Arcade - the oldest in-door shopping mall in America. Also, there's good coffee inside. 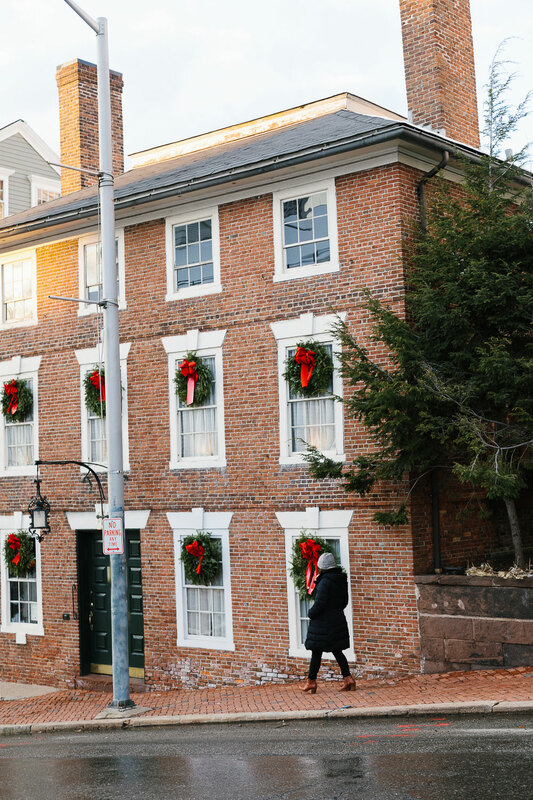 Stroll down Benefit Street and around Brown University - peek at all of the beautiful, historic homes along Benefit Str. dressed up for winter. Prospect Park and College Hill - photo op. nice view of the city and cute neighborhood to walk around. 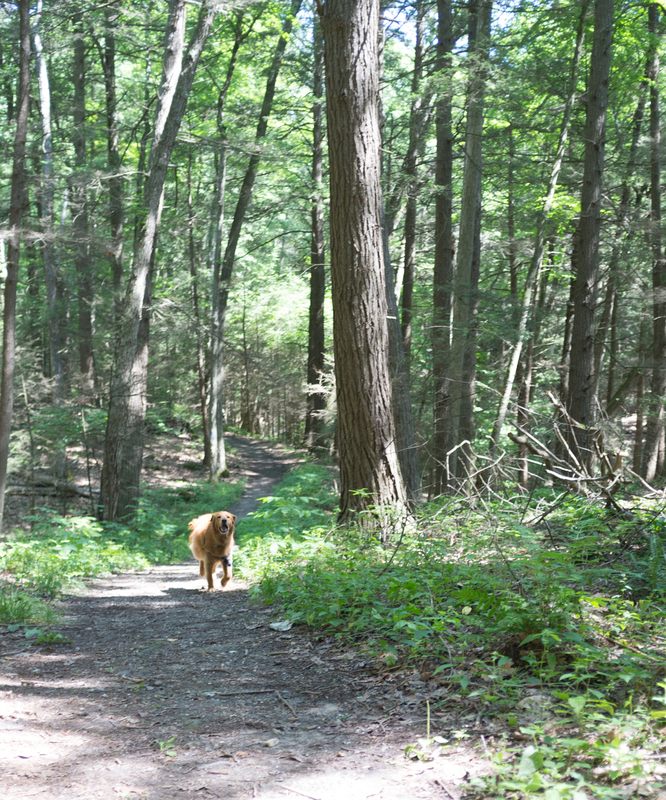 Chase Farm Park in Lincoln, Rhode Island - this was a tip from a dog mom at the Dean. 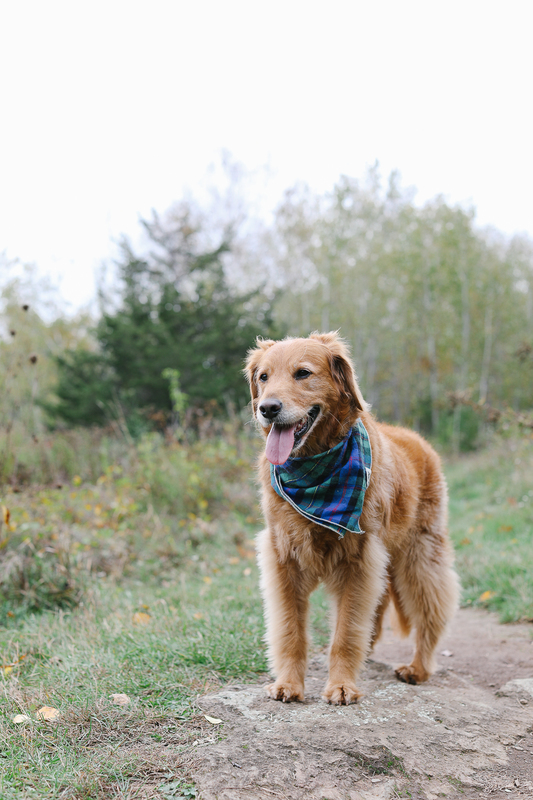 Great off-leash walking through some woods and trails. Feels like Vermont. You could also snow shoe, ski and walk with or without a pet. Lincoln School Dog Park in Providence - if your dog is into dog parks. Family photo op at Chase Farm. Thanks to the skier who took this! Until next time, Providence! Where are your favorite spots in Providence? Did we miss any? We'd love to hear from you in the comments below. Note: We received a complimentary stay at the Dean Hotel. Opinions and images are my own. Thank you for supporting the destinations that make this blog possible! Thank you to the Dean for having us and for being a dog-friendly hotel. Enjoying my morning coffee on the porch at the Birchwood Inn in Lenox, MA. A couple of weekends ago we took a quick family trip to the Berkshires in Western Massachusetts. We spend our summers here, but somehow we've never make it out during any other season of the year. 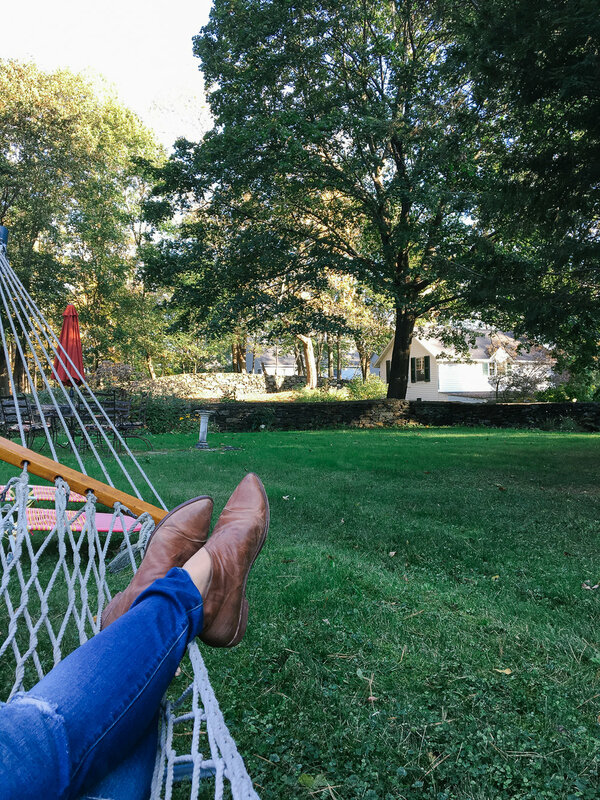 We get wrapped up in our lives in Boston and before we know it, fall, winter and spring have passed and it's time for another summer in the Berkshires. This year, we're making it a priority to visit in the fall, winter and fingers crossed, spring too. 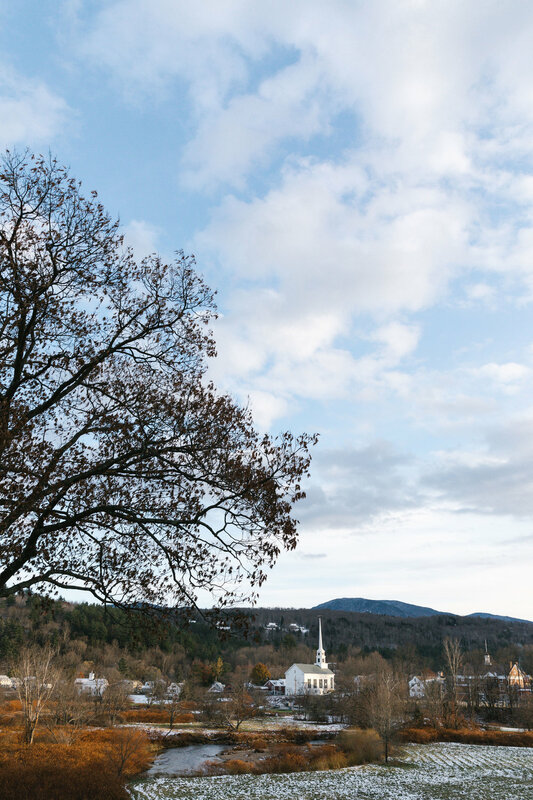 There are so many things that we love about the Berkshires. I wrote about our favorite things to do during the summer here. I'm so happy that we were able to squeeze in this fall trip and experience Lenox in a whole new way. 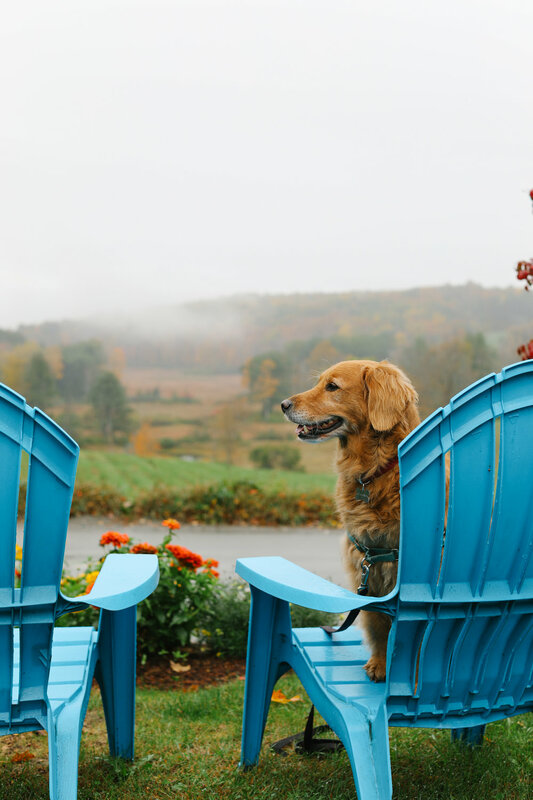 We wouldn't dream of spending time in the Berkshires without Elsie, so we decided to stay at a dog-friendly bed and breakfast in the heart of Lenox, Massachusetts. We drove out after Adam's BSO concert on a Saturday night and arrived at the Birchwood Inn at about 12:30 a.m. I was a little nervous about showing up so late at night but the inn keeper welcomed us in with a smile and immediately gave Elsie a homemade dog treat before showing us to our room. Needless to say, Elsie was thrilled. The entire drive out from Boston I kept thinking how crazy it was to drive out so late at night. It's crazy, right? But as soon as we woke up on Sunday morning I knew that the late-night road trip had been totally worth it. Enjoying the hammock at the Birchwood Inn in Lenox, MA. 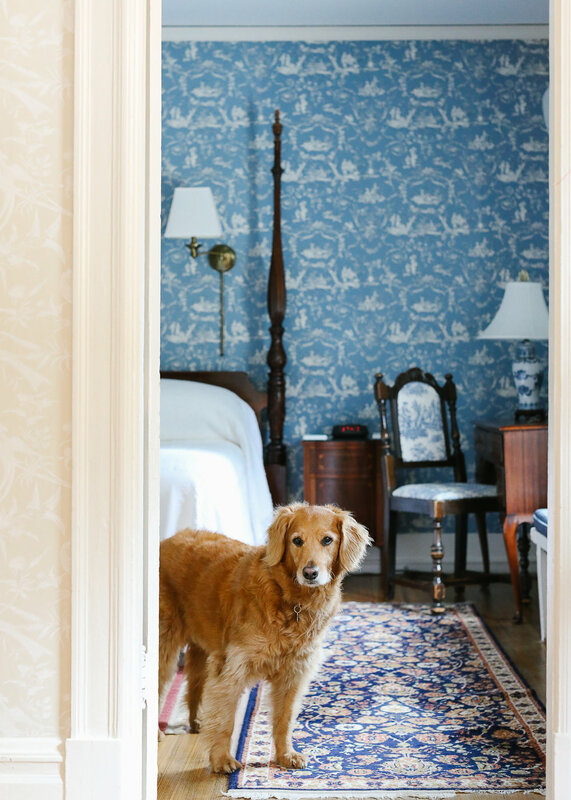 We stayed in the Hubbard room with a king sized bed, a private bathroom across the hall and a dog bed for Elsie. She LOVES staying in hotels. It's the funniest thing. 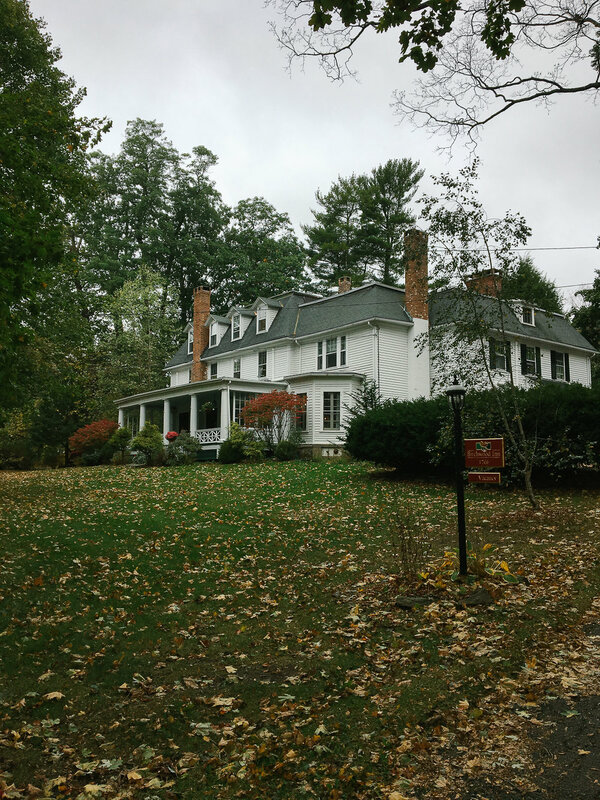 We loved the location of the the Birchwood Inn for its proximity to Kennedy Park which has lots of trails for walks in the woods. It's also only a couple of blocks from the town of Lenox which made it super convenient for walks around town. 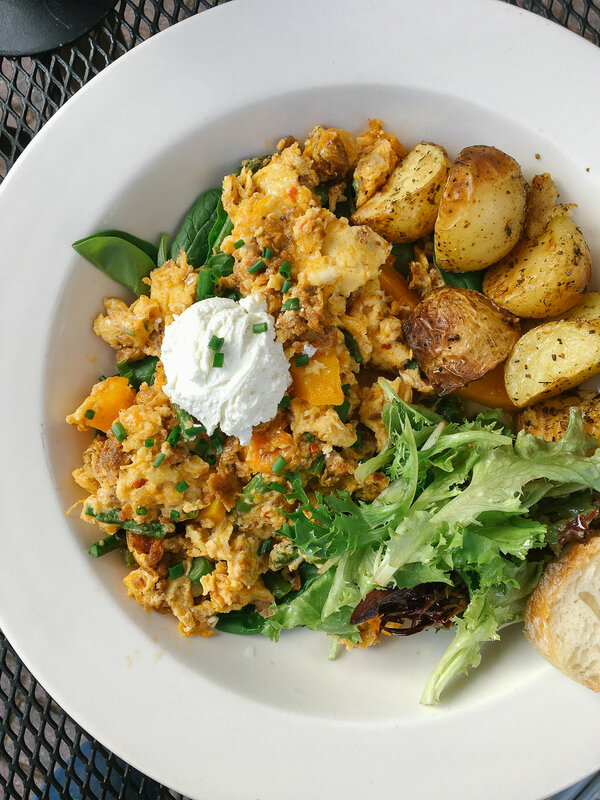 We'd heard rave reviews about the breakfasts at the Birchwood Inn from Adam's parents who stayed here several years ago. My mother-in-law is pretty picky when it comes to food, so we knew it would be good. 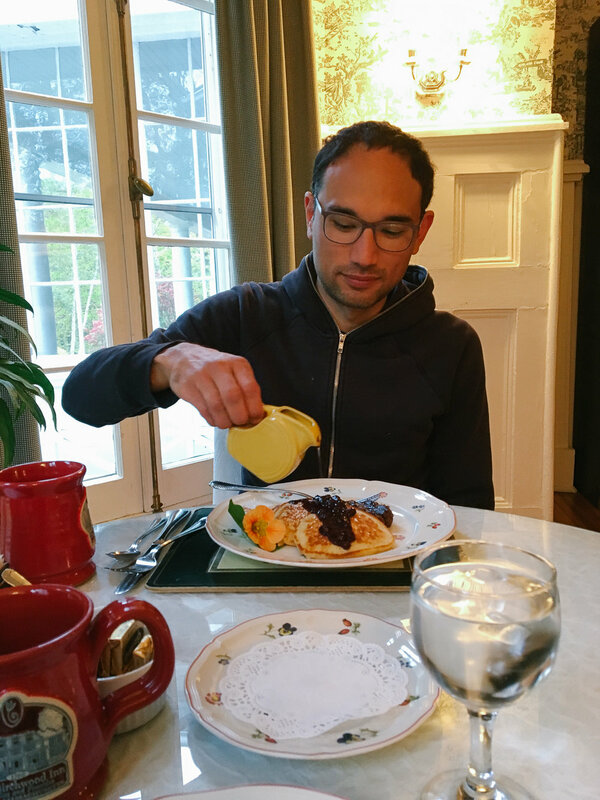 One morning they served pancakes and another they served an egg dish in pastry. The food was delicious but very indulgent. I overheard another guest requesting a macrobiotic meal and I kind of wished I'd requested something on the healthier side. Adam loved it all though! He doesn't have to worry about his waist line like I do. After breakfast we were ready to hit the outdoors. 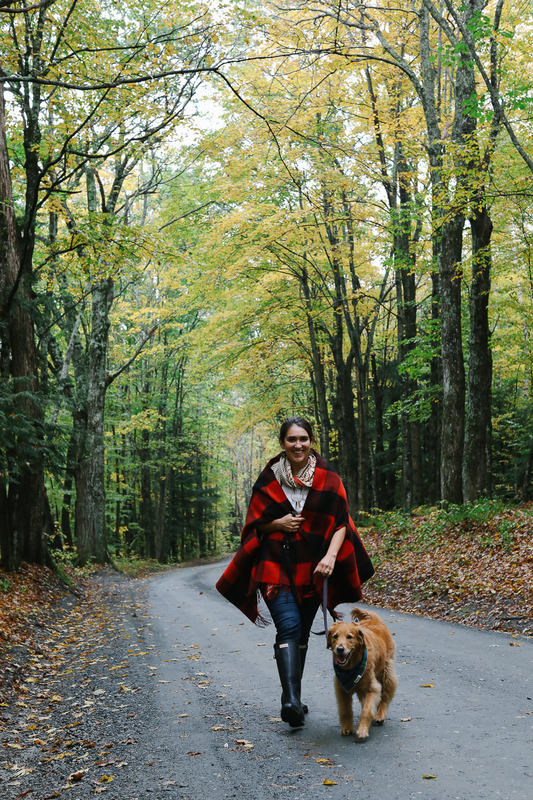 One of our favorite things to do in the Berkshires is hike and we couldn't wait to go for long walks in the woods. We chose Olivia's Overlook for our first hike and spent about 2.5 hours walking our favorite trails. We were hoping to see more fall foliage than we did but it's been such a weird autumn in New England. The trees either didn't pop with color or have done so much later than usual. 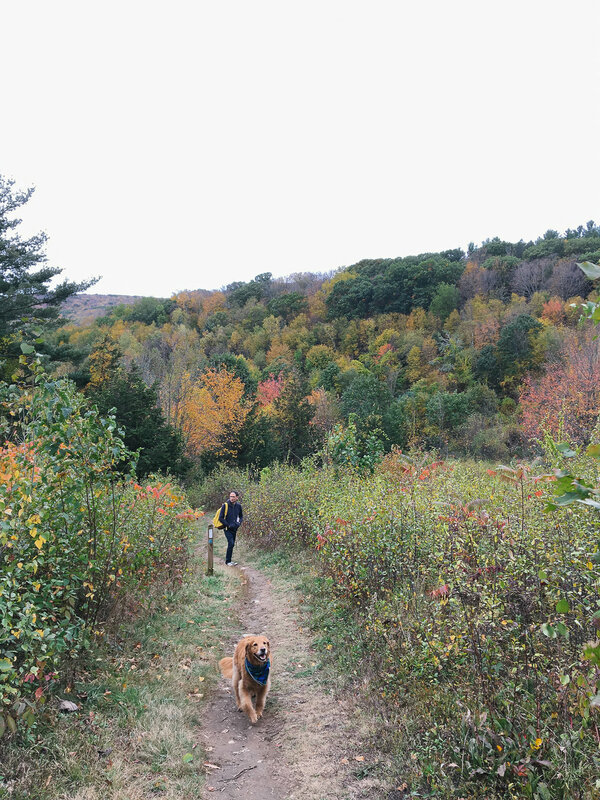 Regardless, we had a great time breathing the Berkshires air and wandering in the woods. The changes in the landscape made everything feel new and exciting even though we hike this all summer long. When we left the Berkshires at the end of the summer, this field was waist high with goldenrod. The bright yellows of summer have faded into muted browns, yellows and reds. After our hike we went to the Stanmeyer Gallery and Shaker Dam Coffee House in West Stockbridge. This has always been our favorite spot for espresso drinks (they serve counter culture) and it's a comfortable place to relax after a long hike. The shop is owned by John Stanmeyer, an award winning photojournalist who's work you may have seen in National Geographic. 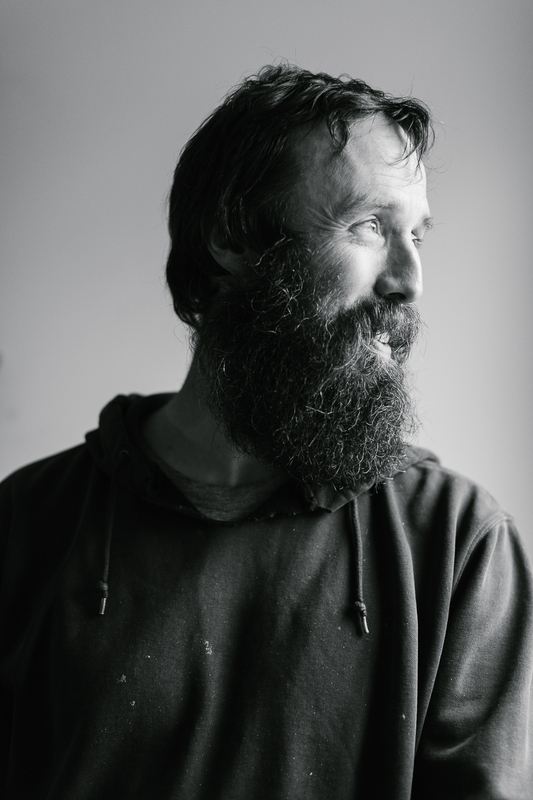 Be sure to walk around the gallery and check out his work if you're ever in West Stockbridge. Next we made our way back to Lenox for lunch at Haven Cafe and Bakery. This is a go-to breakfast and lunch spot for us so we knew exactly what we wanted to order. I had the aegean salad and Adam had some kind of brunch dish that he doused in hot sauce. 🤣 After lunch we went back to the Birchwood Inn and relaxed in our room. For dinner we hit another Lenox favorite, Nudel. We had such a great meal there! It's always good but this one really hit the spot. I didn't get any photos because it was late and we were so hungry that we inhaled it all soon after it arrived. You can't go wrong at Nudel. Day two in the Berkshires looked pretty similar to day 1. Breakfast at the Birchwood Inn followed by another favorite hike. 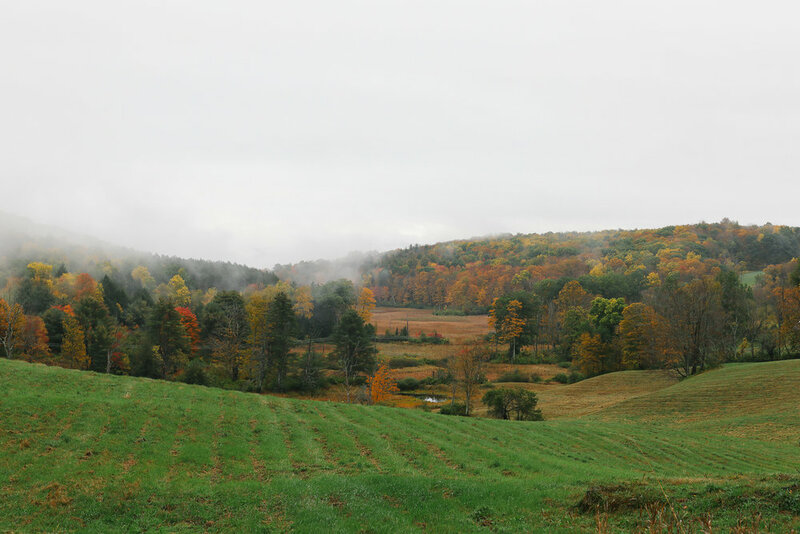 Last summer my friend Einat re-introduced us to the hike at Tyringham Cobble. We must have walked this 2.1 mile loop a dozen times last summer. It quickly became my favorite place to walk Elsie. It's also a great place to forage wild blackberries and raspberries in the summer months. The loop meets up with the Appalachian Trail which is kind of cool and last summer we often saw through hikers making their way to Maine or Georgia. We didn't see any this time but we did see some decent foliage along the way. The lookout has a nice view and you get a nice workout climbing your way up. We highly recommend this loop! After our hike we drove around to some of our favorite places. 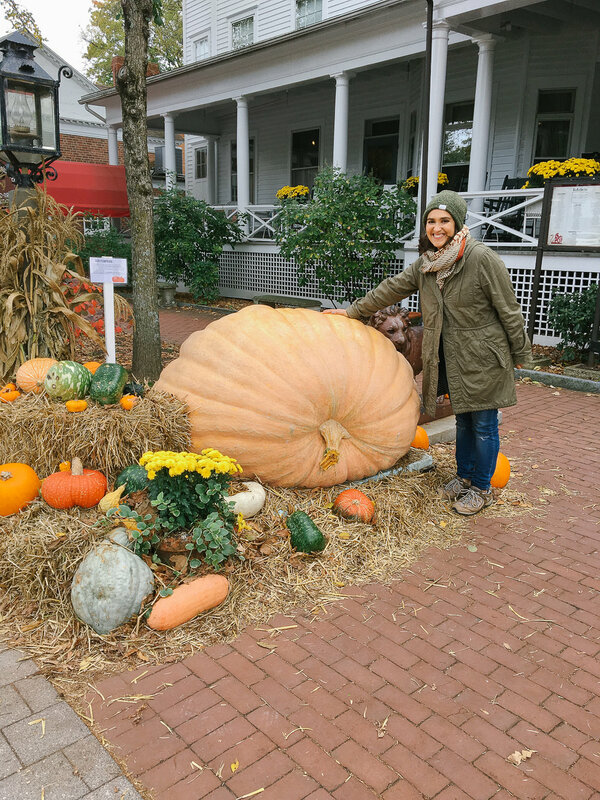 I wanted to stock up on my favorite food items that I can't get in Boston, so we hit Guido's, the co-op in Great Barrington and we couldn't resist a stop at the Red Lion Inn for their pumpkin display. We also stopped at Taft Farm to check out their gnarly heirloom pumpkins! It's fall after all. Couldn't leave without seeing all the autumnal displays. Pumpkins at Guido's in Pittsfield. Holy giant pumpkins at the Red Lion Inn. Warty pumpkins at Taft Farm. After the loveliest weekend, it was time to hit the road and head back to Boston. We'd hoped to squeeze in a visit to Ramblewild (Adam's never been!) and a drive up to the top of Mt. Greylock but we ran out of time. They're on the list for next time. It was a quick couple of days but we felt so recharged and happy to be back in our happiest places. Until next time, Lenox! Until next time, Birchwood Inn. Where's your favorite fall destination? Do you travel with your pet? 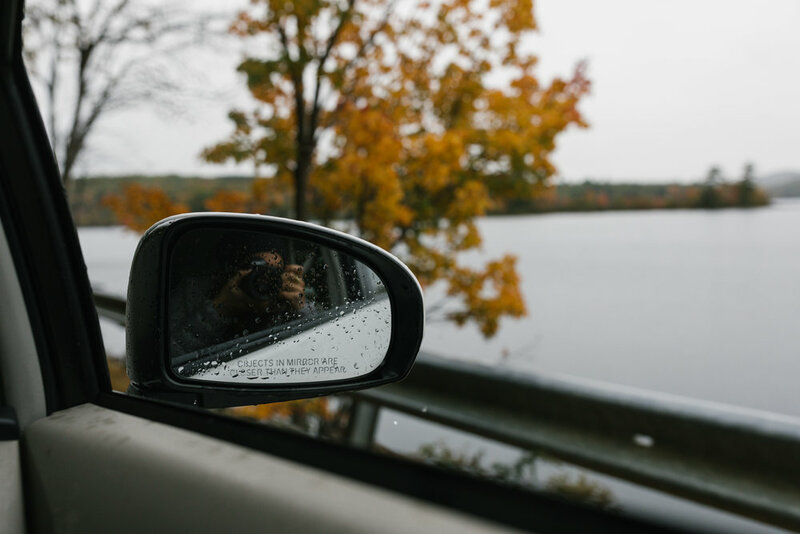 Share your favorite fall getaways below in the comments so we can add them to our list! 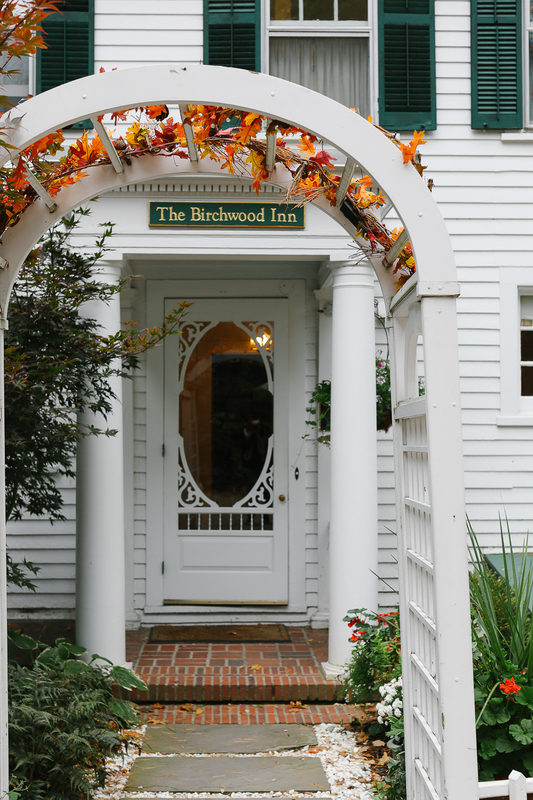 Note: We received a complimentary stay at the Birchwood Inn. Opinions and images are my own. Thank you for supporting the destinations that make this blog possible! Thank you to the town of Lenox and the Birchwood Inn for having us! 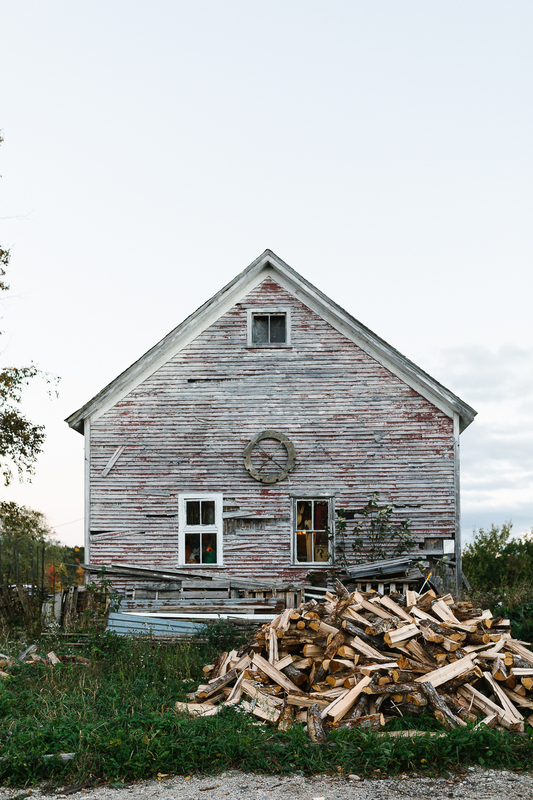 A gorgeous barn we stumbled upon on the backroads to Woodstock, Vermont. Adam and I took a spontaneous road trip up to Vermont last weekend to see a little fall foliage, get some 'Hidden Rose' apples at Scott Farm Orchard and meet up with my friend Kelby in Woodstock. Our first stop was at Scott Farm Orchard in Dummerston, Vermont for some heirloom apples on what happened to be #heirloomappleday. Maybe you've heard of heirloom tomatoes, but did you know that there are also heirloom apples? Scott Farm grows 120+ varieties of apples and we were excited to check out their heirloom apple collection. We didn't do any pick-your-own this time because I've already gone apple picking twice this season, but we spent a good amount of time enjoying the farm market where they sell many varieties already picked for purchase. Some of my favorites were the 'Orleans Reinette', 'Ananas Reinette' and 'Pound Sweet'. Our main objective was buying as many 'Hidden Rose/Mountain Rose' apples as possible for styling and photography purposes, but we quickly became fascinated with apple history and all of the incredible heirloom varieties that were new to us. The orchard itself is gorgeous and we would go back in a heartbeat. Yankee Magazine named them one of the best spots for apple picking in New England and we can see why. 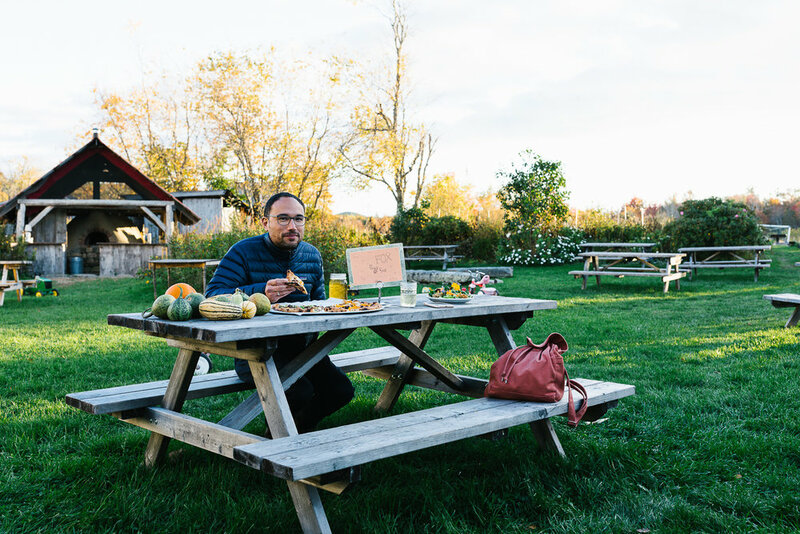 They have wood-fired pizza on site with lovely seasonal flavors like Kielbasa with kale and cox orange pippin apples and delicata squash with maple dijon, grafton 2 year cheddar and pound sweet apples. They even have gluten free dough! 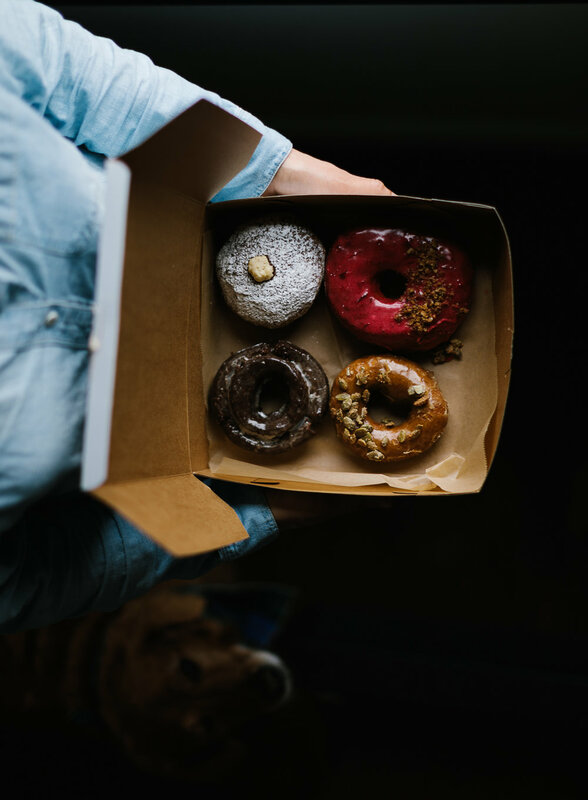 Of course, you can also get cider donuts, pies, fresh heirloom cider and hard cider to boot. Adam indulged in a pizza, cider donut and a hard cider and he was pretty happy about it! We also purchased a half gallon ball jar of their Heirloom cider and it's incredible. Be sure to pick some up if you visit. Ready for some heirloom apples at Scott Farm Orchard in Dummerston, VT.
After our stop at Scott Farm Orchard we made our way toward Woodstock for dinner with the Cushmans and an overnight stay at Weaving Dreams Farm. 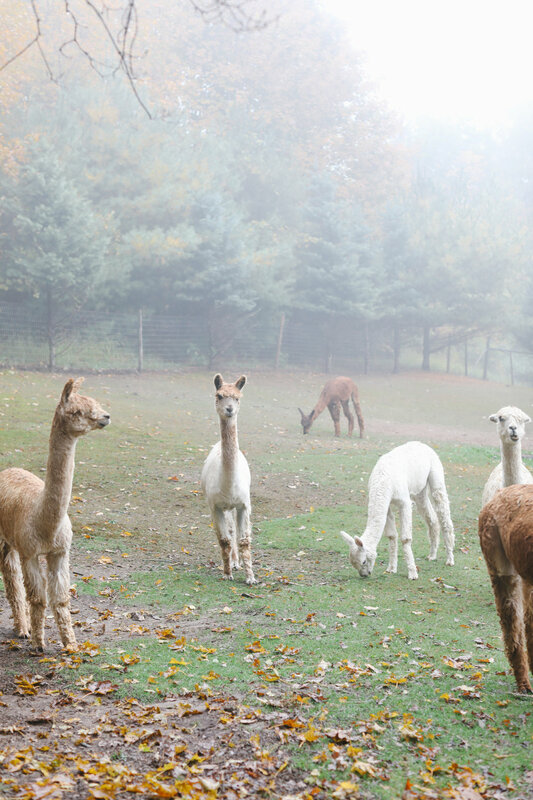 We found this alpaca farm on airbnb and highly recommend it if you're looking to stay in the Woodstock area! Since we planned this trip super last minute, the dog-friendly hotels in Woodstock were already booked up (hello, columbus day weekend!). Thankfully, there's airbnb and everything in the reviews about this place was true. 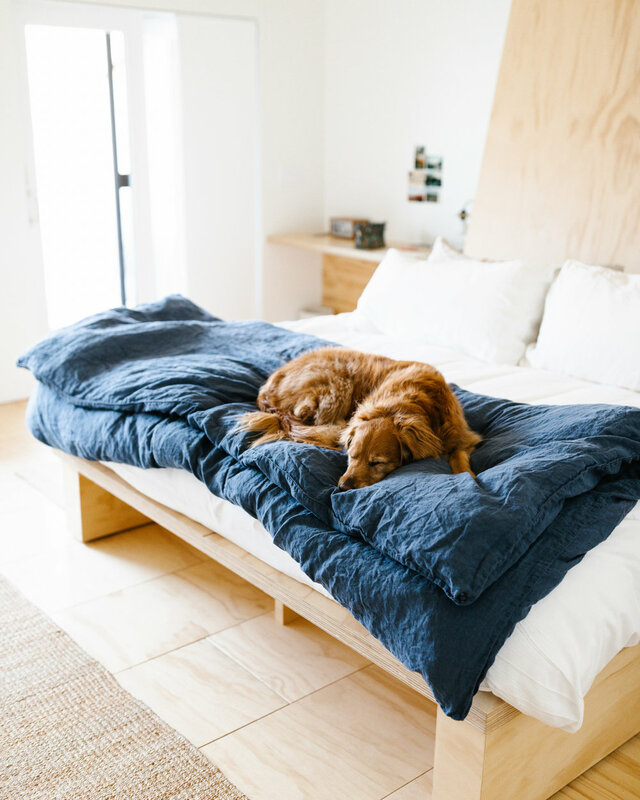 There's a fabulous view, a clean and spacious dog-friendly room and the suri alpacas are adorable. 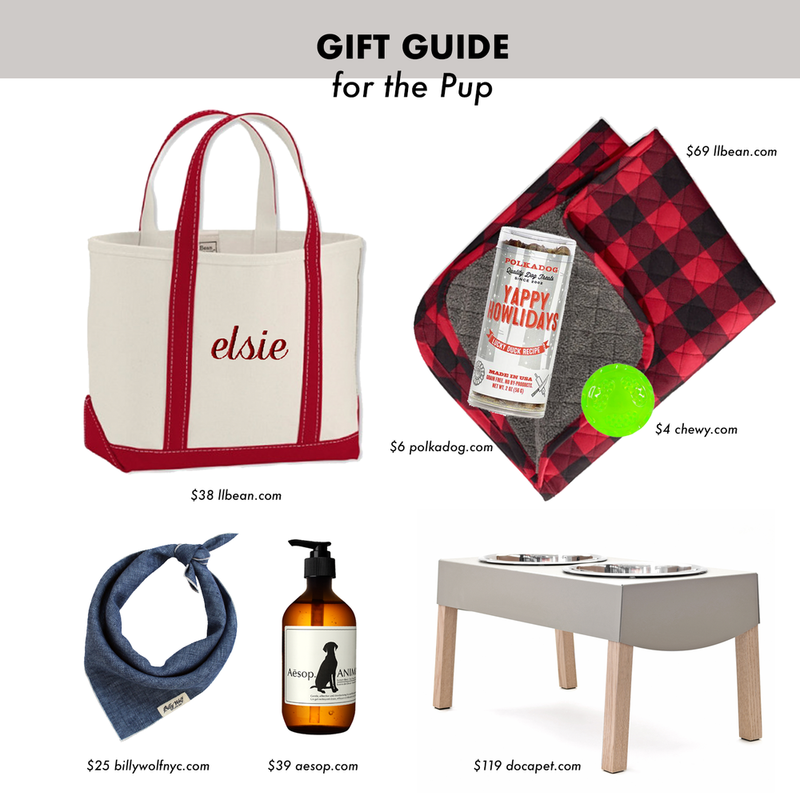 The owner, Lauren, was very hospitable and she has a cute pup named Mojo that Elsie got to know while we were there. 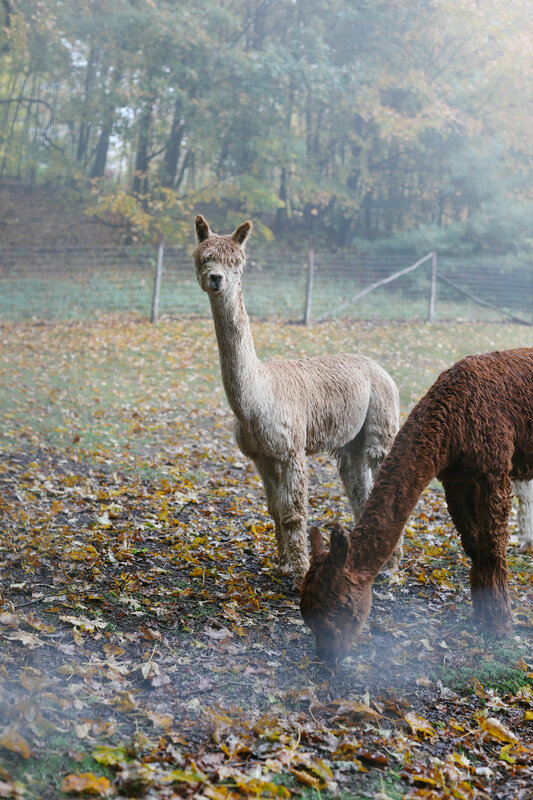 I asked if I could photograph the alpacas and she welcomed me into their area. They were so curious and sweet and I enjoyed getting to know them while Adam did some practicing up stairs. It was very therapeutic and relaxing! 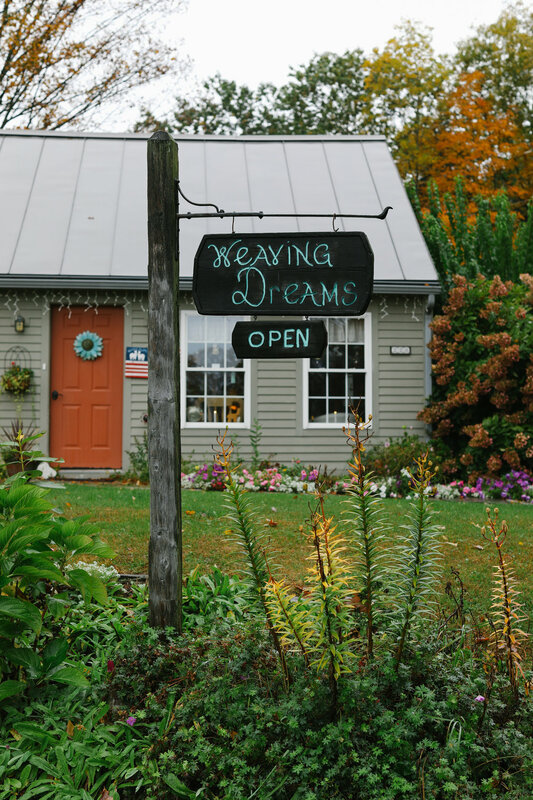 Weaving Dreams Airnbnb in Hartland, VT. The view at Weaving Dreams in Hartland, VT. Pull up an adirondack and enjoy the view! After a restful night we were ready to hit the road and see some foliage. But first, breakfast at Hartland Diner. Our airbnb host was insistent that Hartland Diner was the place to go for breakfast so we tried it out. We loved the diner vibes and enjoyed hearing the waitress offer everyone pie after they finished their breakfast 🤣. 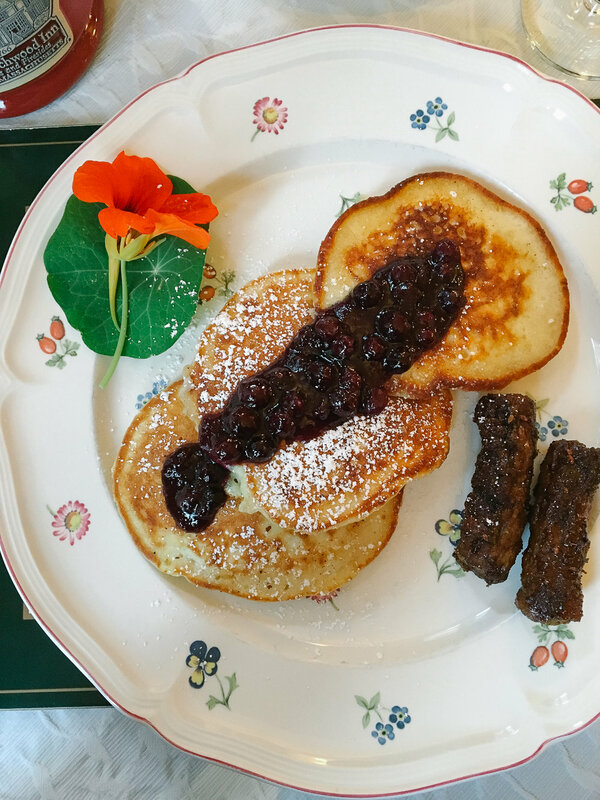 They serve "Vermont sized pancakes" and every other breakfast thing you could imagine. Adam got the corn beef hash 🤤 (so good!) and I was had a veggie omelet. It's been so long since we've been some place with bottomless mugs of coffee. Reminded us of the good old days in PDX at Byways Cafe. This was the perfect place to fuel up before a foliage drive. 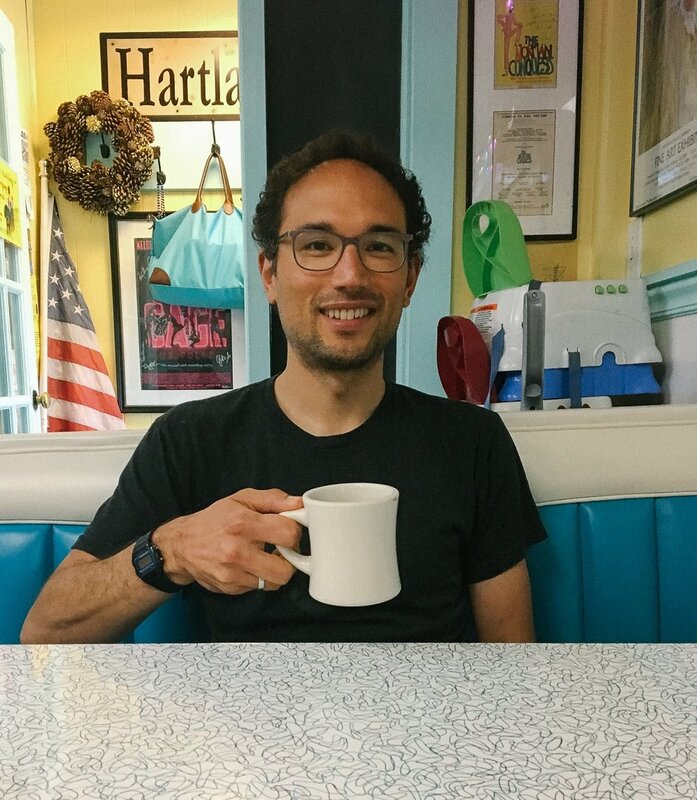 Breakfast at the Hartland Diner in Hartland, VT. Leaf peeping on the back roads! After a long drive down some backroads we made our way back to Woodstock to hike Mount Tom. As you can see, there was lots of fog, but once we got on the trail to hike it started to rain. 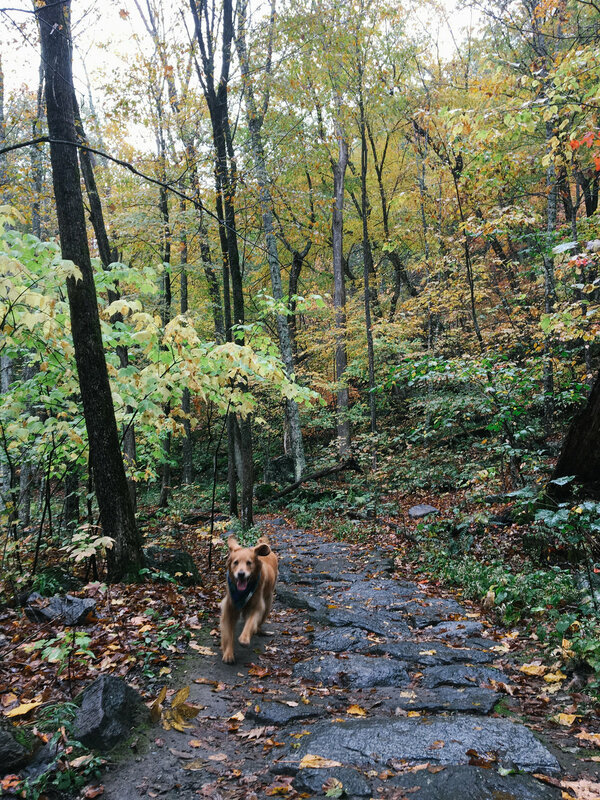 We don't mind rainy hikes. Again, reminded us of our Oregon days. 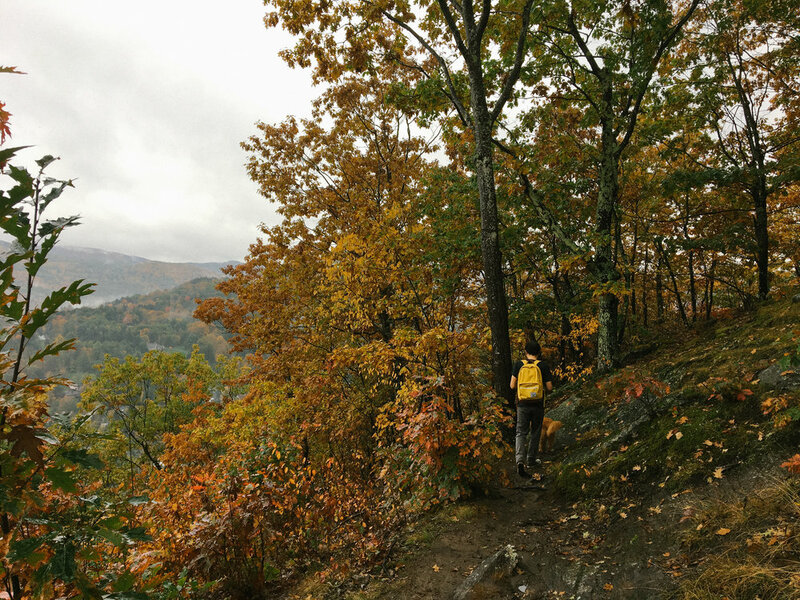 We hiked the Faulkner trail to the top and took in the panoramic views of Woodstock Village and the mountains. Elsie had a blast on this trail. So many chipmunks to chase! It feels like a lot of switchbacks (and it is!) but it was a great hike. This was a fun way to see Woodstock from a new perspective. Plus, we were away from all of the crowds. After our hike we made our way back to Boston. Still kicking myself for not stopping at the Woodstock Farmers Market for some local eggs. Next time! As usual, I wish we could have stayed longer. 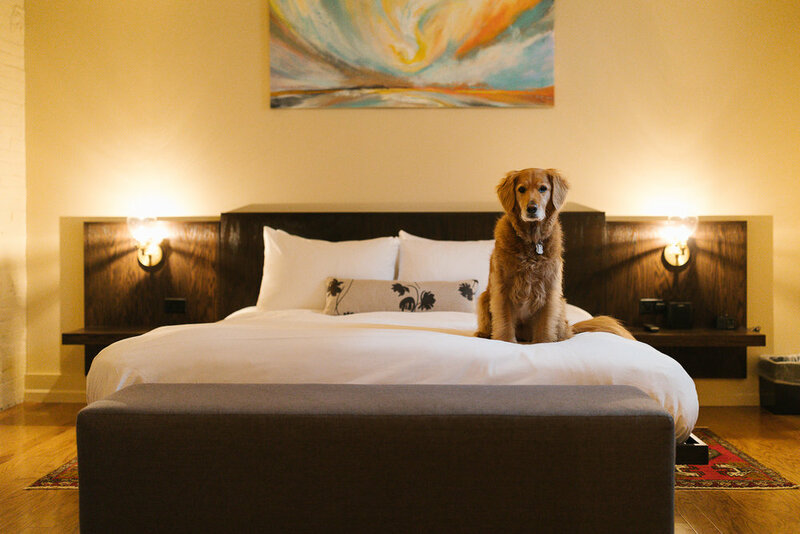 If Airbnb isn't your thing, the Woodstock Inn and Hotel 506 are both dog-friendly! Just don't try to book a room at the last minute like we did. 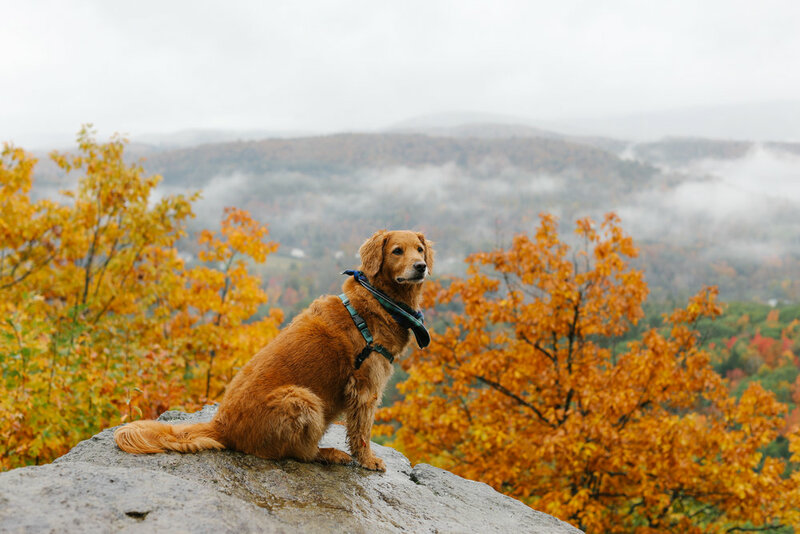 Elsie posing at the top of Mount Tom in Woodstock, VT.
Making our way down Mount Tom in Woodstock, VT.
Where are your favorite spots for leaf peeping? Last year I went to the White Mountains in New Hampshire and there was so much more color! Share your favorite spots below, if you'd like. Thanks for reading! The Salt Lake City Mormon Temple. How many brides do you spy down below? Last Friday my nephew got married in Salt Lake City, Utah! He's the first of my nephews and nieces to get married so this was a big deal for my family. 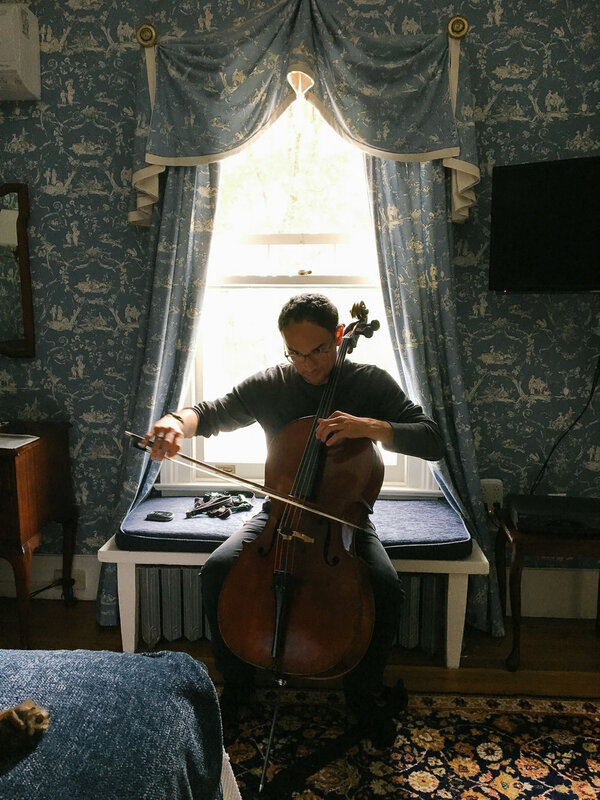 I knew that Adam wouldn't be able to make it to the wedding because the BSO was recording Brahms symphonies that week, so I made all of my travel arrangements ahead of time and traveled solo. Relaxing in my suite at Hotel Monaco with the gold fish they provide for guests traveling without their pets. I was in Salt Lake City earlier this year for my niece's high school graduation, so I knew exactly where I wanted to stay when I returned for the wedding. Hotel Monaco is in the heart of downtown and steps away from my go-to espresso bar, Three Pines Coffee. Whenever I travel I'm always on the hunt for good coffee and will travel great lengths to find it. 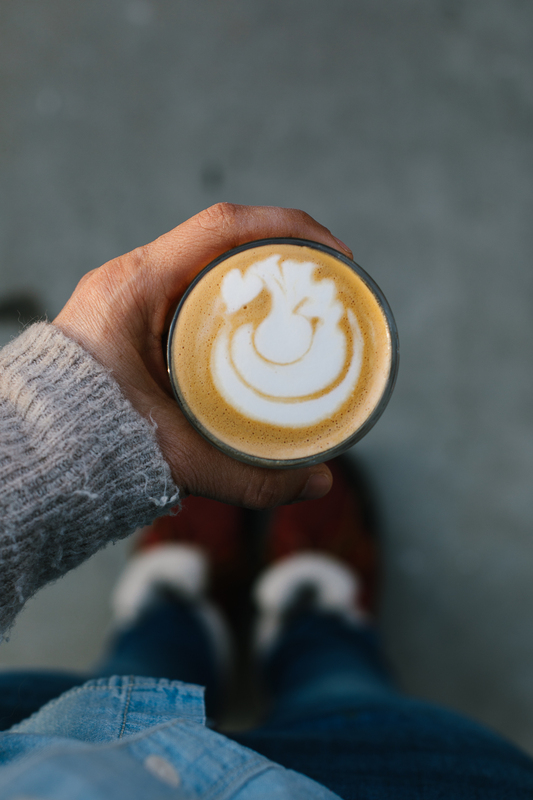 Luckily, Salt Lake has a bustling coffee scene so there are several good options near downtown! Every room includes a stuffed animal on the bed. I got a moose this time! Sadly, I didn't have time to take the hotel loaner bikes out for a spin or make it to the complimentary wine hour, but they're on my list for next time. I did however unroll the in-room yoga mat to get my namaste on before the wedding. It was so great to get in a little yoga practice and relaxation after the long flight. 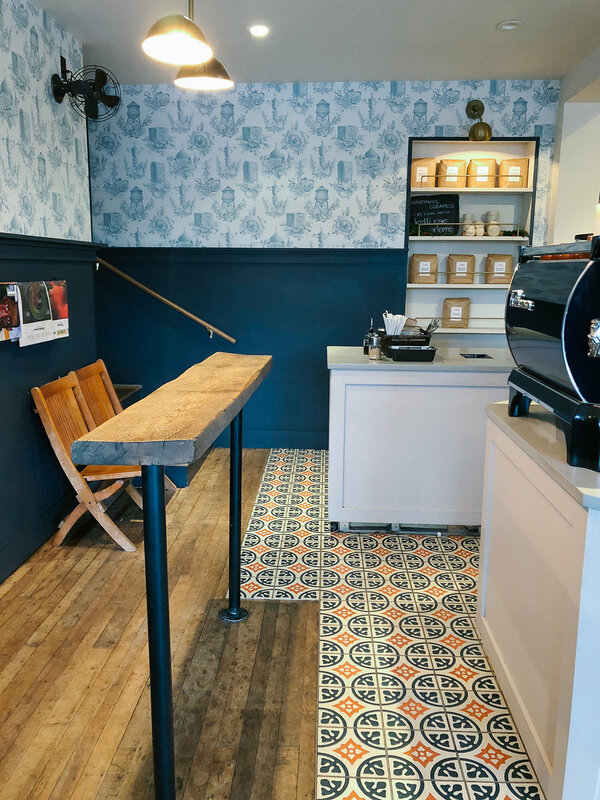 I discovered Publik Coffee on my last trip to Salt Lake and their avocado toast was so memorable that I couldn't wait to return. Served on a slice of bread as thick as a brick, it's generously slathered in avocado that's been smashed with olive oil, sea salt, and pepper. It's dang good! Especially accompanied by one of their locally roasted espresso drinks. There are a couple of locations downtown to choose from. It was a fluke that I found this place. I was driving around in my mom's rental car looking for a nail salon when I drove past and saw the word BISCUITS on the building!! I pulled over to make a note on my iphone of the name, Sweet Lake Limeade and Biscuits. Later on I mentioned this place to my other nephew who lives in Provo and we made a date to check it out. When we arrived there was a long line outside of the restaurant (usually a good sign) so we got on the list for a table. The wait was around 45 minutes - we were in no rush so we tooled around the neighborhood until we got our table. It was a gorgeous, sunny day so we were happy to sit outside. We chatted with the owner 'Hoss' a bit before ordering. It turns out that my sister who lives in Utah knows his mom. 😂 He and his wife have been selling limeade at area farmers markets for years. She had a dream of opening a restaurant one day, so they opened Sweet Lake about four months ago. Sweetest story, tastiest biscuits! We can't recommend this place enough. We ordered the Hoss and T-Rose off of the brunch menu but honestly, everything looked awesome. For next time: Arte Haus Collectif - I popped by this adorable gallery and shop on my last day in town, a Sunday. Mormon culture rules in this town thus they were closed. Next time!